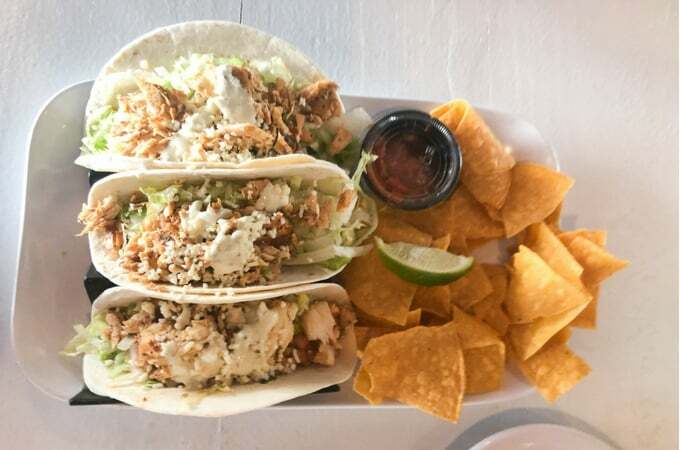 One of the best things about Gulf Shores, Alabama is the INCREDIBLE food. I feel like all we did was eat when we were there and I am not complaining about it one bit! Since we visited so many great places while we were there I am going to list them in the order that we visited them and give you details on my favorite dishes and favorite things about each restaurant. 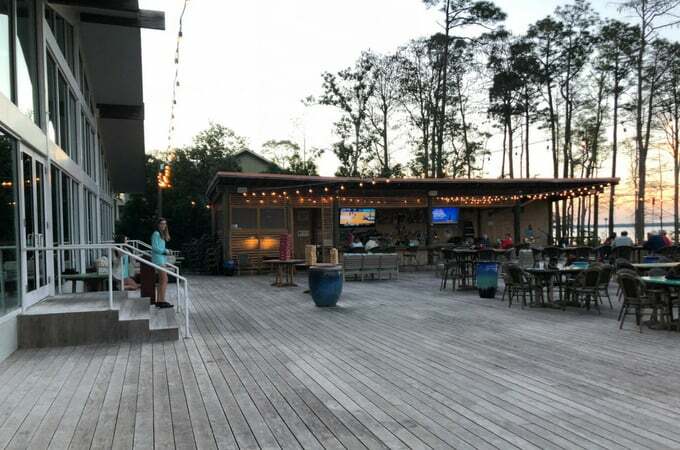 As soon as we arrived in Gulf Shores we checked into our condo and headed to dinner at GTs on the Bay. The atmosphere in this place is almost as good as the food! 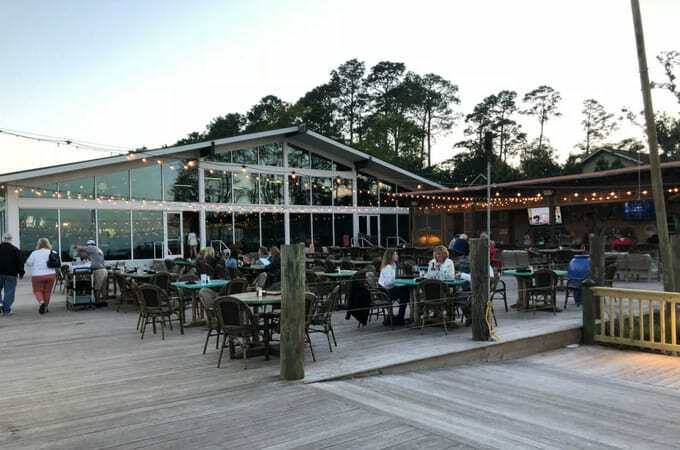 The restaurant is large and open which gives a happy feel to the place and the patio and outdoor bar with a boardwalk that leads to the water is absolutely incredible and something that I’d visit that restaurant for over and over again if I lived there. 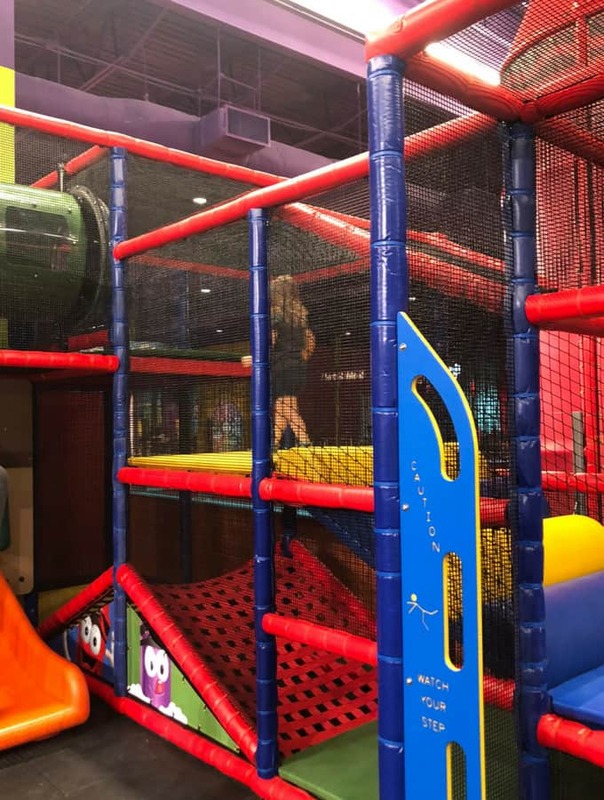 They also have a large play area for kids which was awesome for keeping them entertained while we were waiting on our food or just letting the adults chat with each other after our meal was over. 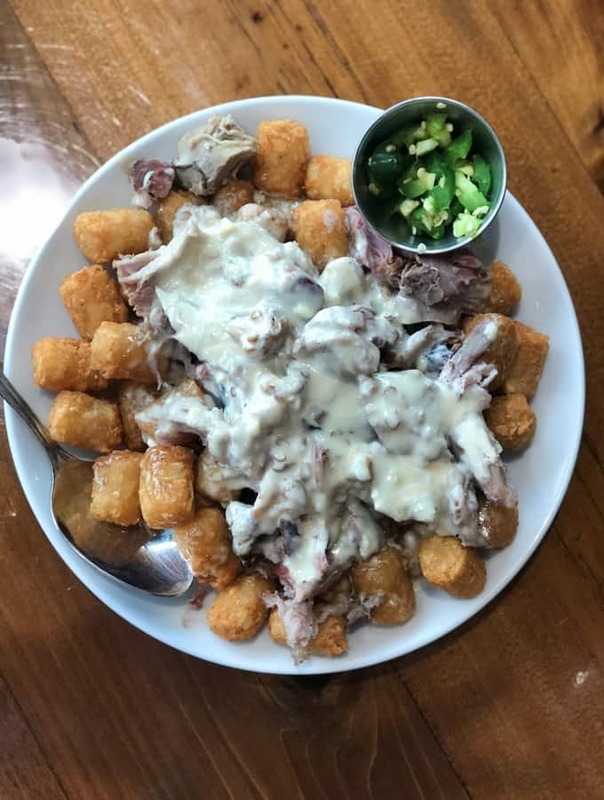 We got the totchos for an appetizer which is tater tots covered in smoked pulled pork, sliced jalapeños, smoked Gouda cheese sauce and white BBQ. 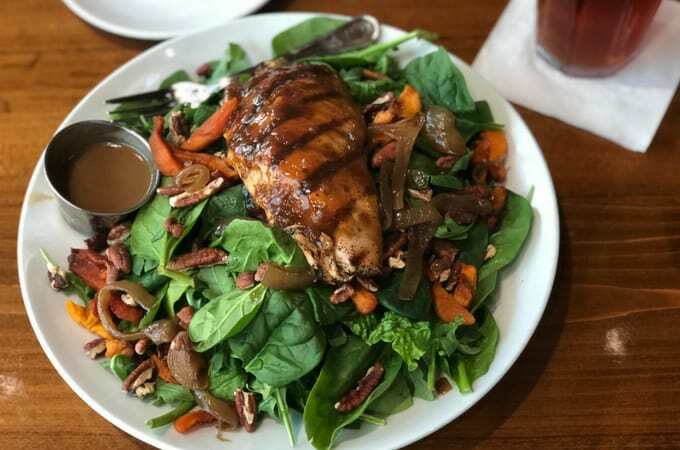 I had the salmon salad which I highly recommend it was really really good. My husband ordered the GTs grouper which he still talks about months later. He is on a mission to find grouper that tasted as good as the plate he had here. 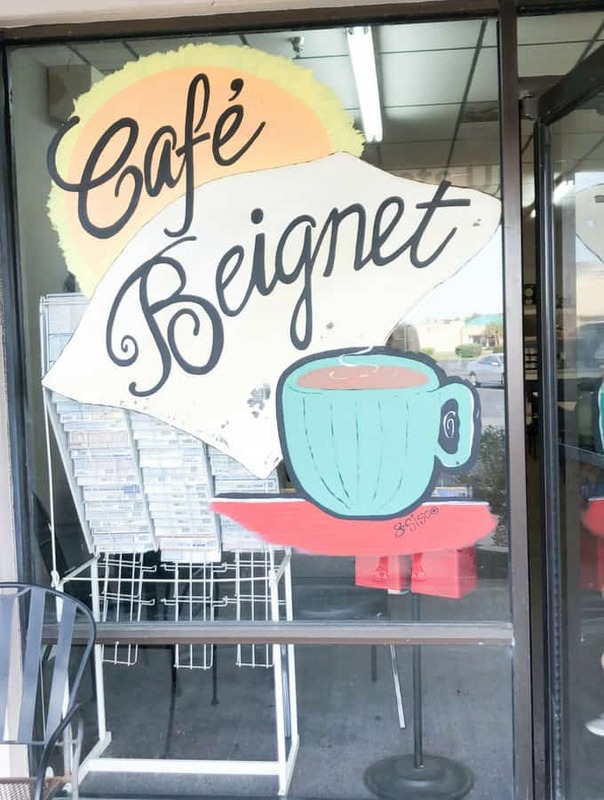 To be 100% honest with you, none of us had any idea what a beignet was before we arrived here so we had no idea what to expect. 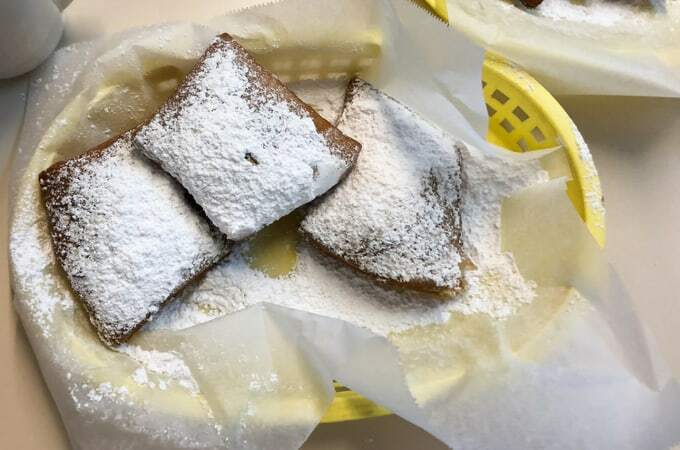 Basically, it is a filled donut or sopapilla. We all agreed that they tasted more like a thicker sopapilla. They were absolutely heavenly. They also served delicious coffee and cappuccinos! This place was probably my favorite place to eat the whole time we were in Gulf Shores. The atmosphere was fun and the food was to die for. I had (no exaggeration) the BEST burger that I have ever had in my life here. I can’t even remember the last time I ate an entire burger this size, but I sure ate all of it at Anchor Bar & Grill. 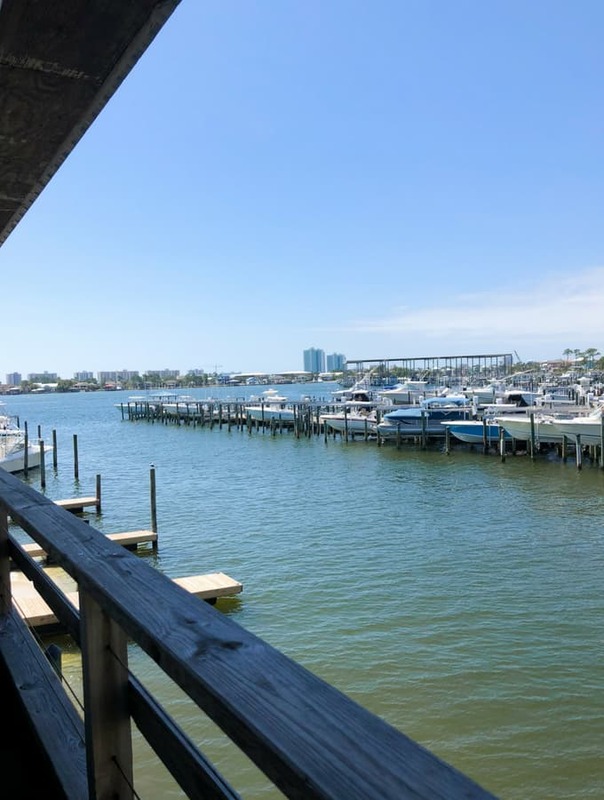 The restaurant is right on the water so the views while you are eating are fantastic. We were there on a beautiful day so sitting on the patio was a no brainer. The menu here is small, but the food is so good that it doesn’t even matter. You can’t go wrong with anything you order here! 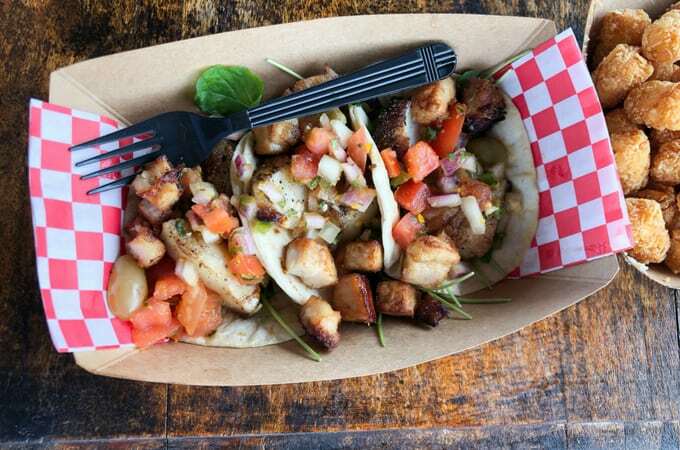 In addition to the burger, we also ordered the Scallop Taco, the kids PB&J, and the Cuban. All of it was delicious! This BBQ joint was located at The Wharf which has a ton of little restaurants and shops to explore. There was a boat show going on there while we were visiting which was super fun to see! 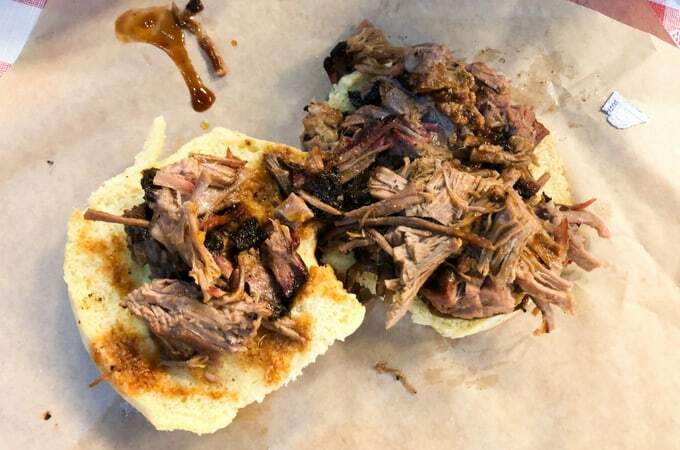 The BBQ is SO GOOD here. It was almost gone by the time we made it to dinner. That is how many people were in and out of this awesome little restaurant! The owner was there when we were and he sat down and talked to us for a while. Such a nice guy, thank you for making us feel so welcome! 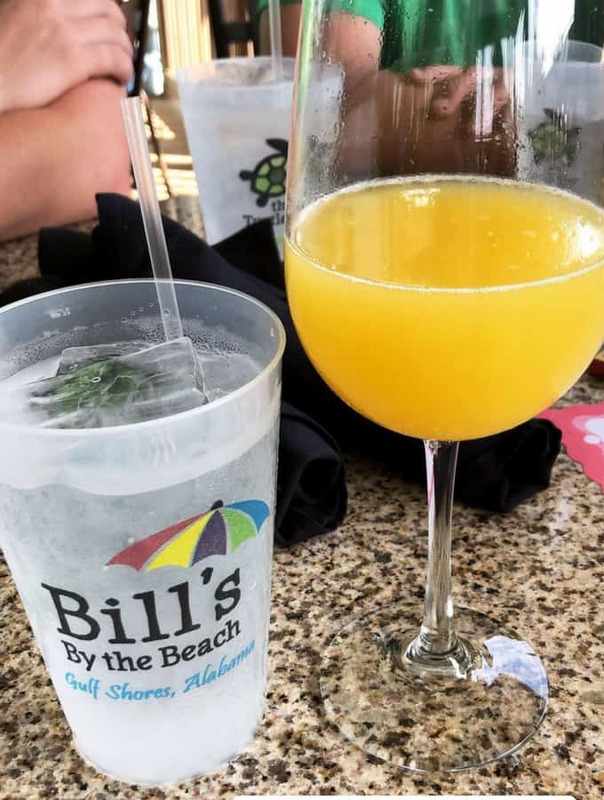 Breakfast is my favorite meal of the day and Bill’s by the Beach did not disappoint. 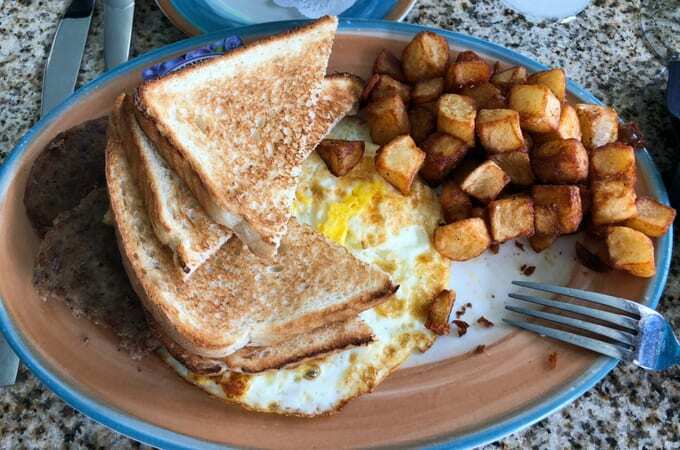 I had a classic egg, toast, and potato breakfast with a mimosa and it was amazing! The patio is perfect for nice sunny weather which is where we sat while we were there. This restaurant is tied with Anchor Bar & Grill for me for the favorite of our trip. The food was great, but the atmosphere there is what really made it worth the visit! 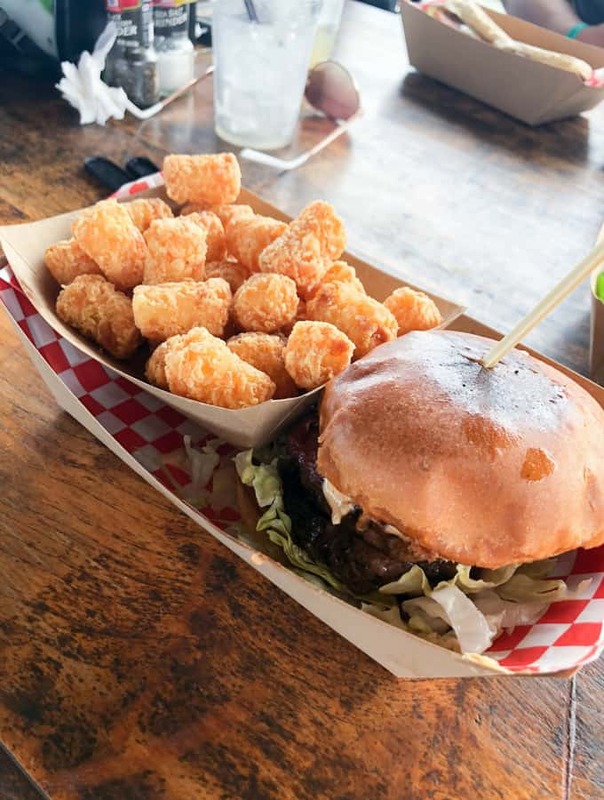 It is right on the beach and you can literally walk out of the restaurant right on the beach with your food and drinks! 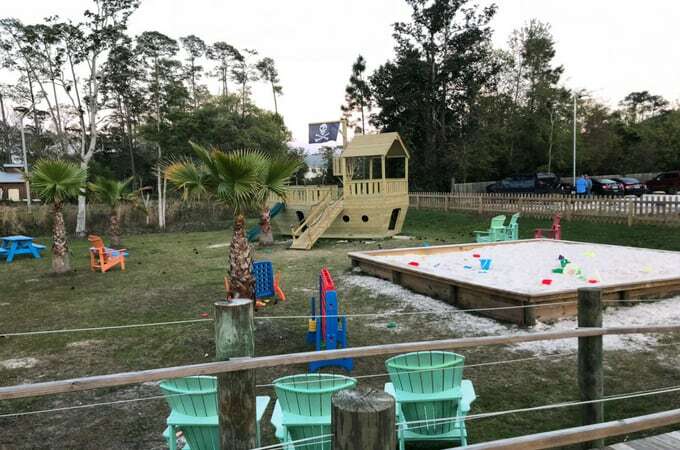 The building is open so you get the sea breeze inside and there are all kinds of entertainment for both kids and adults while you are eating. The place is seriously SO FUN. This is the view out the back patio at The Hangout! So amazing. They have a huge drink menu which is super fun too. I highly recommend their Moscow Mule. It was delicious! 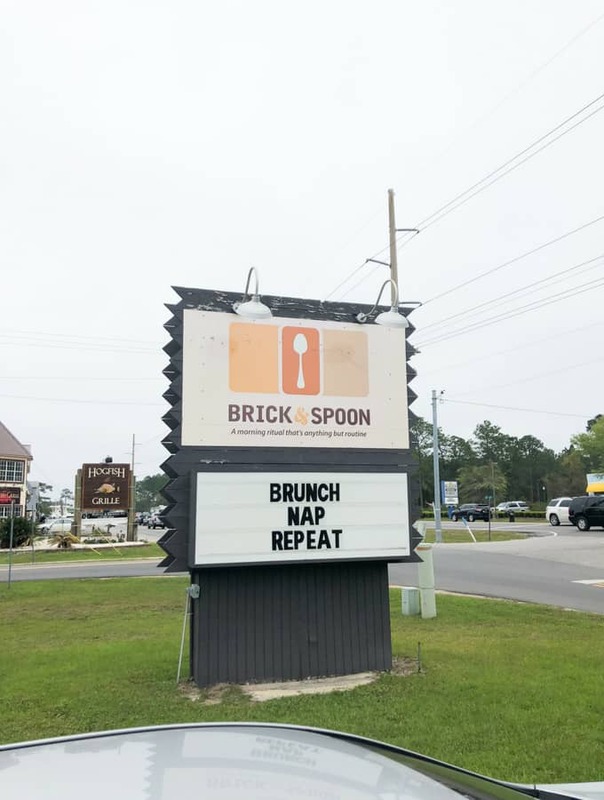 For our final meal in Gulf Shores we headed out for brunch at Brick & Spoon. The place was PACKED so we were pretty excited to see what all they had to offer. Upon arrival, we received a bloody mary menu where you could create your own which was super cool, but we were in more of the mimosa mood so we enjoyed traditional and flavored mimosas while waiting on our food. The food was well worth the wait for a table. 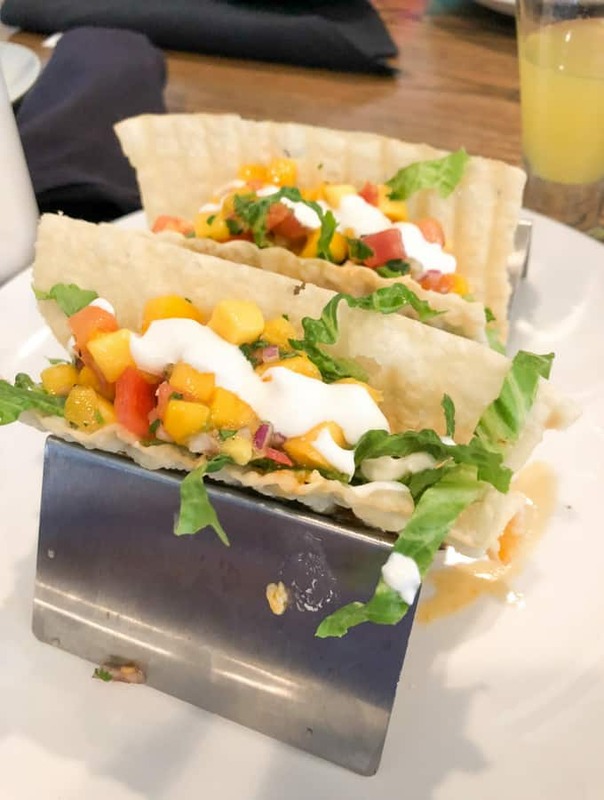 I had some KILLER breakfast tacos that I wish I could figure out how to make at home! This was the perfect last stop for us on our way out of town. 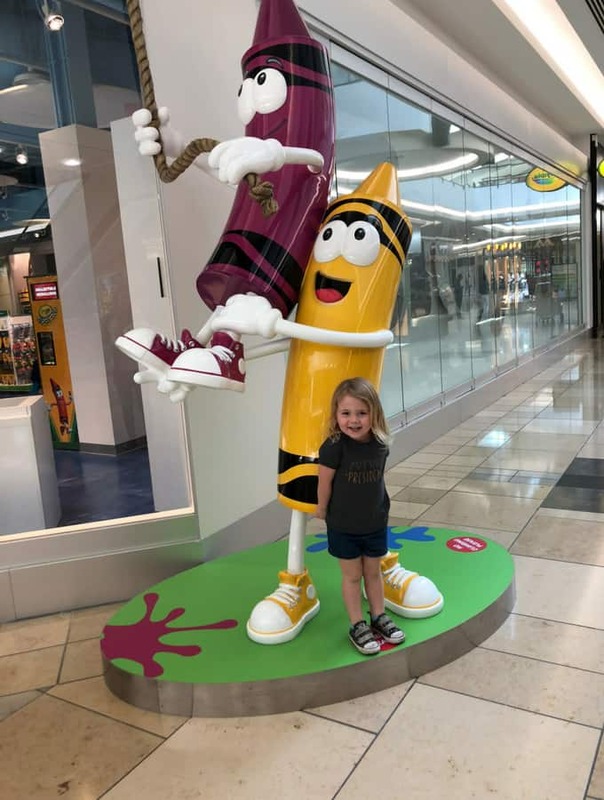 A few months ago we were invited to a special launch event for the Crayola Experience in Plano, TX! It was unlike anything I have ever been to and we had an absolute blast. There were endless things to do and from 10am to 2pm we didn’t even fit in every activity there and the attraction was closed to the public so there were no lines. 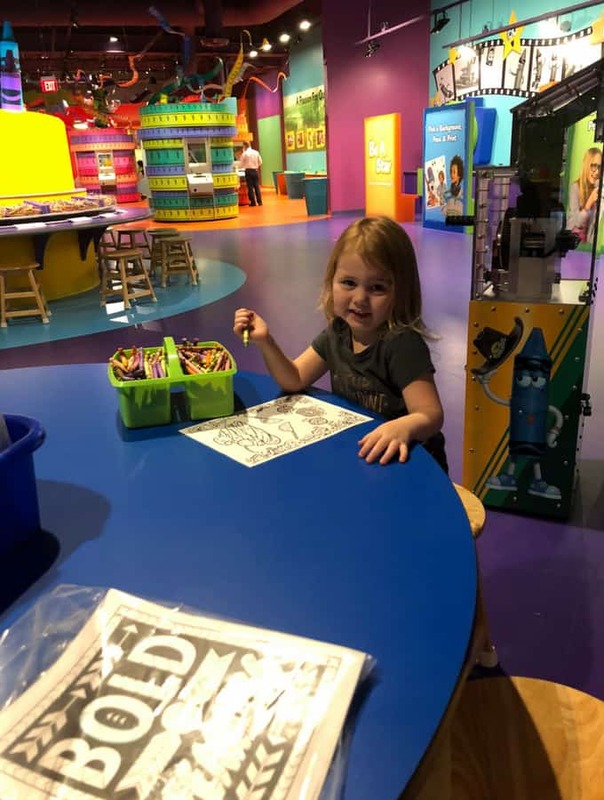 The Crayola Experience is truly jammed packed with fun and you could totally spend an entire day here with your kiddos. Here, there are tables and chairs with traditional paper, scissors, and colors for kids to sit down and create whatever they want. 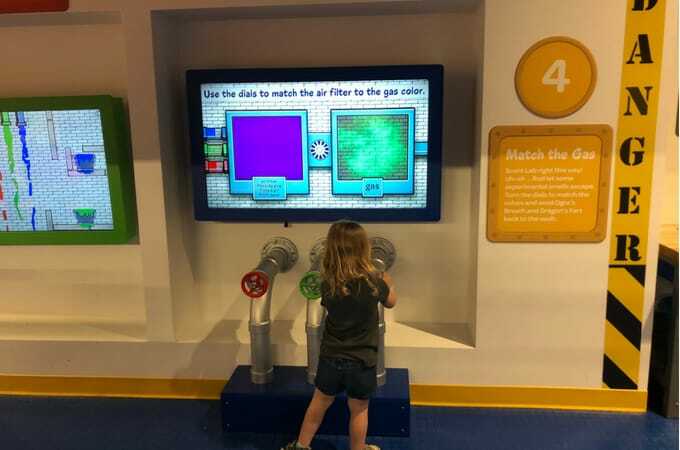 This was one of our favorite rooms at The Crayola Experience. You are given a tablet when you go in and the room is set up with various stations. Each station has a puzzle or riddle that you must solve using the tools given to you and the tablet. It was super fun and one of the stations that Braylee did over and over again. At this station, you can turn yourself into your very own color page! You take a picture and then a sketch of your image is printed out for you to color! I brought this one home and pinned it up in my office. 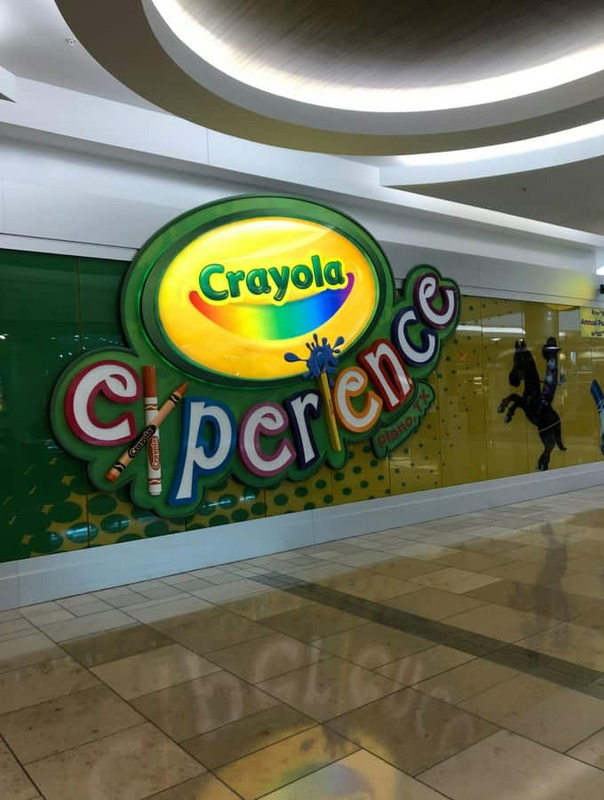 I guess they knew you’d be spending an entire day here because The Crayola Experience has its very own cafe with lots of lunch and snack choices. In an augmented reality experience, bring your very own creation to life! This is one of the stations that we didn’t get to, but it looks SUPER cool. This is one of the attractions that I had to drag Braylee away from. 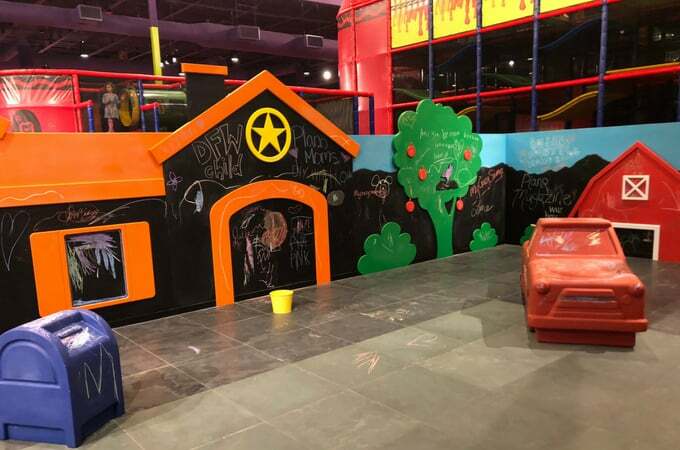 Color Playground is a 2 story playground and Toddler Town is a toddler version of the playground with slides and other fun things. Like I said, Braylee LOVED this part and I was able to just sit back on the bench and let her have a blast with the other kids. This is a HUGE bin with Crayola colors in it and coloring sheets for kids (and adults!) to sit down and enjoy. This station allows you to become a dancing crayon. You stand in the designated area in front of a large screen and when you move the crayon on the screen moves too! 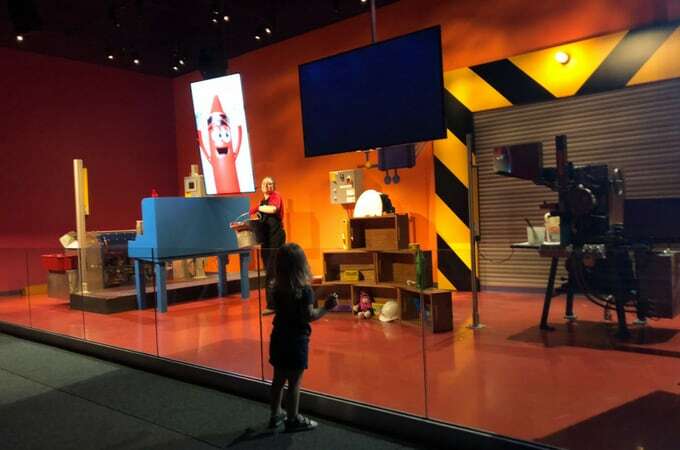 Here you can watch a Crayola crayon being made LIVE with real factory equipment! I loved watching this show, but Braylee did get antsy about halfway through. She is only 3 though so older kids might enjoy it more. Another one of our favorites that we did several times! Using a machine, you melt your chosen crayons and use the melted wax to create a spinning colorful creation. We loved seeing the end result of different color combinations in the machine. It is one of those projects that you have to do yourself to get the whole experience. It is hard to explain, but super fun to do! Standing in front of a large screen, you can put yourself in a jumbo kaleidoscope! This was one of our favorites too! You pick your favorite color and then use a machine to melt your crayon into a cool shape! We made a racecar and a ring! Here you can melt your favorite Crayola color and paint a masterpiece with the melted wax! 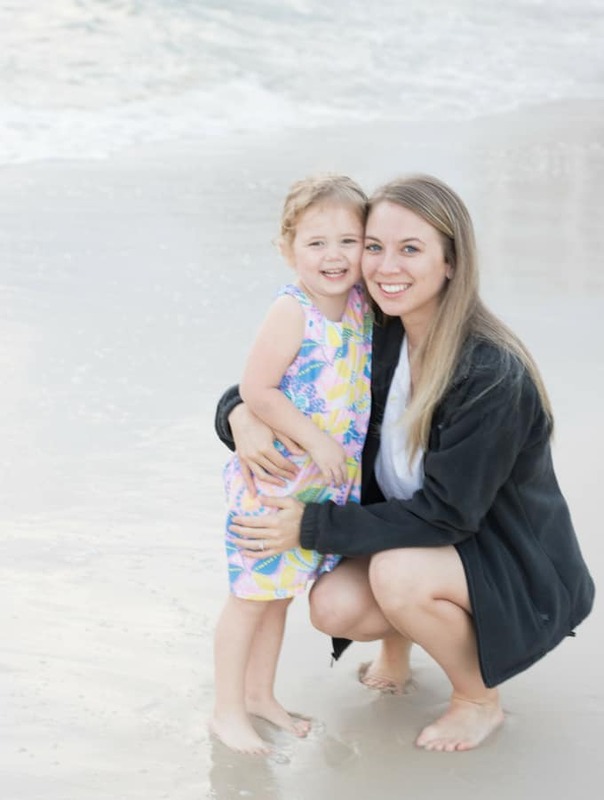 We recently took a 12-hour road trip to Gulf Shores, Alabama and while it was totally worth it I can now for sure tell you that road trips with toddlers are not easy. I now know that 3 is officially the age where kids start asking “are we there yet”. 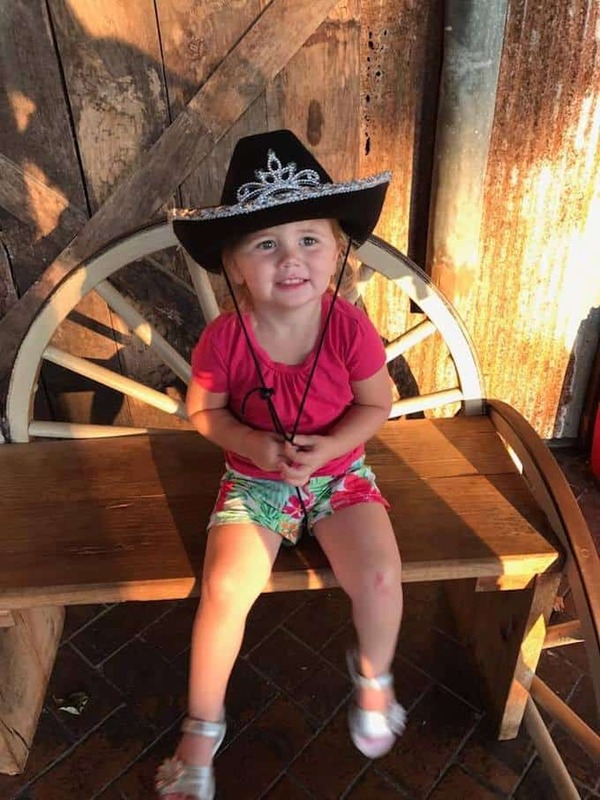 My daughter is potty trained so you can imagine how many potty breaks were requested. And just like ours, their little bodies get very uncomfortable in a car seat for that many hours too. We are doing this again in June when we drive 12 hours to Colorado so I figured, if I need these tips again, someone else might too. 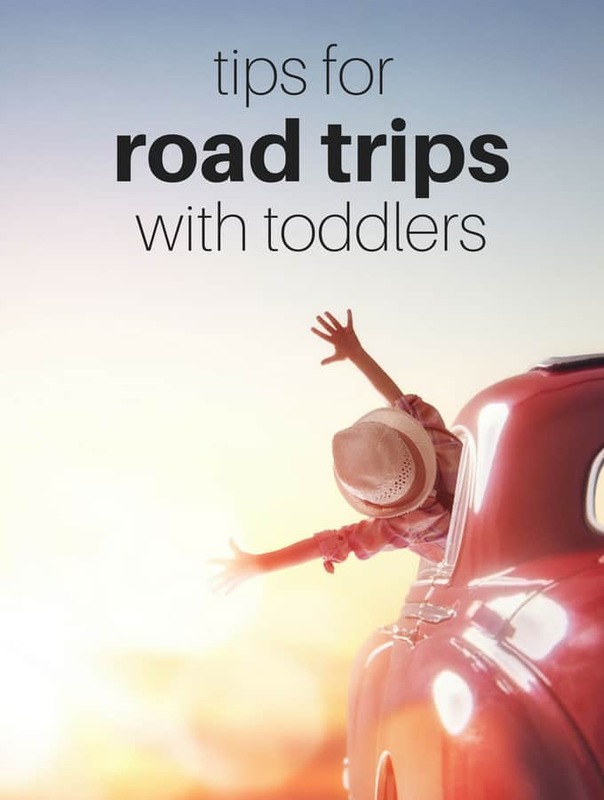 So I am sharing my best tips for road trips with toddlers. I think one of our best decisions was to leave at my daughter’s bedtime. She stayed awake for a few hours longer than she normally would at home, but after watching a movie on the iPad she fell asleep and slept through the entire drive. We did put a pull up on her because she typically wears a pull up to bed still and this cut down on the number of times we stopped too. Just make sure your driver is well rested because a night trip like that is not easy, but if you can make it through the night it is awesome for kids. Technology doesn’t always have to be bad for kids. We have an iPad that we keep Netflix on so that she can watch movies while we are driving (we have portable wifi) and have downloaded several educational apps for her to play. One of our favorite educational apps is ABC Mouse. It does cost money though. If you do some digging around the app store it is pretty easy to find apps that will teach your toddlers the alphabet, counting, shapes & colors, etc. I’ve found the most through searching “preschool” in the app store. The best investment we made for road trips or even just longer drives with toddlers is a pair of Bluetooth headphones for kids. They have noise control so that kids can’t hurt their ears by turning the volume up too loud and they don’t have cords that will tangle or get messed up. She uses them for music, for her educational apps, and to watch movies on the iPad. These are the pair we bought. Another one of the best things we did was make her a Spotify playlist on our account. In combination with the Bluetooth headphones, we now do not have to listen to Frozen for 12 hours. You can do this with Pandora too and just create them a Disney station or something similar. If you aren’t planning on driving at night, pack snacks and drinks ahead of time for the kids. If not, you will most likely be stopping…a lot. 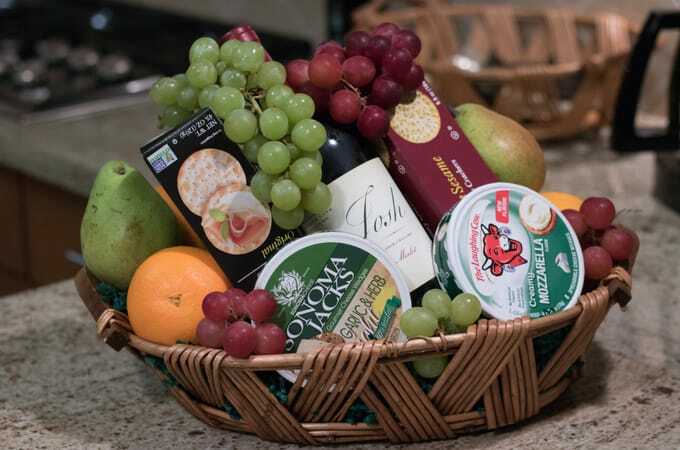 Kids get bored on the trip and want to snack so you are better off just bringing along their favorites. This also can prevent the kids from eating junkie gas station food the whole time! I actually have not tried this, but have seen them all over Pinterest. Basically what they are is bags or boxes full of boredom busters to keep kids occupied on long drives. I’ve also seen them in school pencil bags too! There are TONS of ideas for these so I will just link the Pinterest search so that you can find something that your kiddo will be interested in! We’re headed on our second 12-hour drive in just a few days so if I come across any other hacks or tips for road trips with toddlers I will be sure to update you! 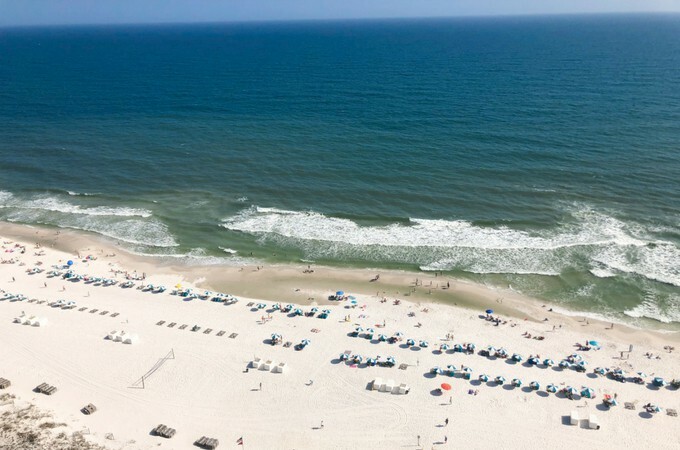 As you may have seen over the past few months I have been recapping our incredible beach trip to Gulf Shores, Alabama. 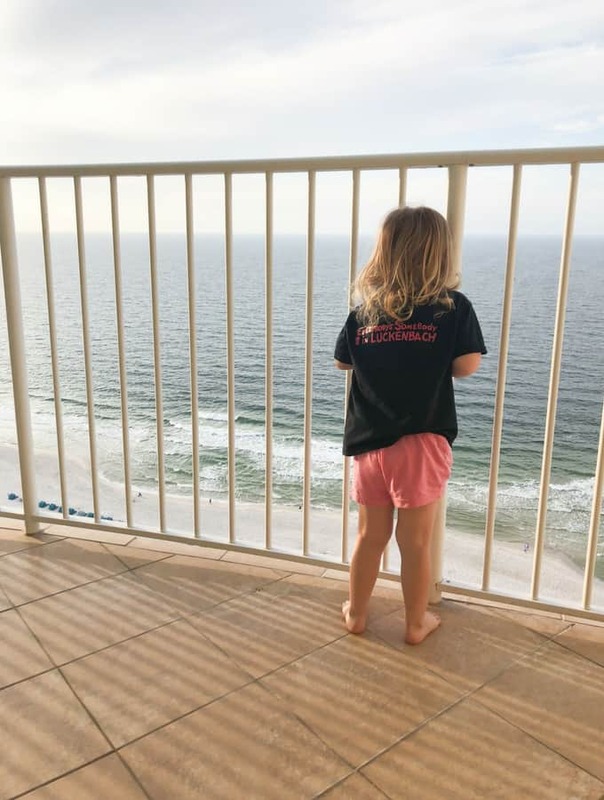 I detailed all of the fun things to do with kids in Gulf Shores and now I am going to give you a virtual tour of our incredible condo! Thank you to Spectrum Resorts for hosting our stay! 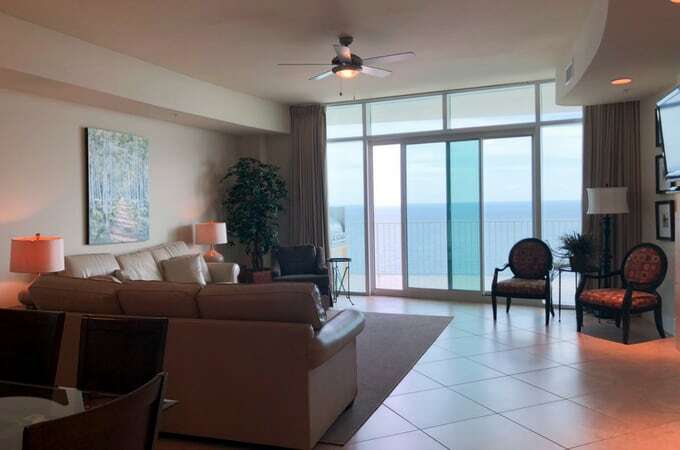 This condo was the most amazing place I have ever stayed. It was perfect for families and comfortably slept all 5 of us who came on the trip. We could have spent the entire vacation at Turquoise Place and never left, that is how nice it was! 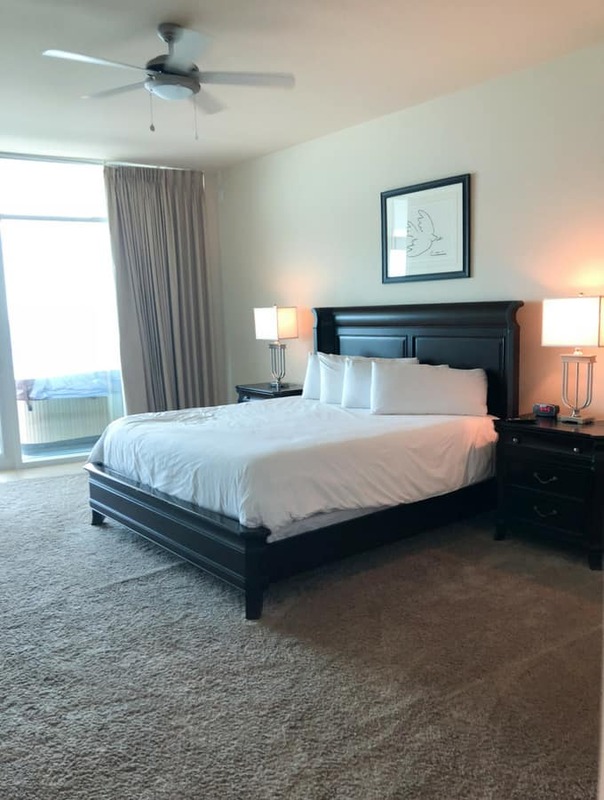 When we first arrived in Gulf Shores and got to the condo we were all in awe of how beautiful and spacious it was. We each had our own rooms with the kids sharing a room that had 2 twin beds in it which was really nice. Oh goodness, the view was incredible. 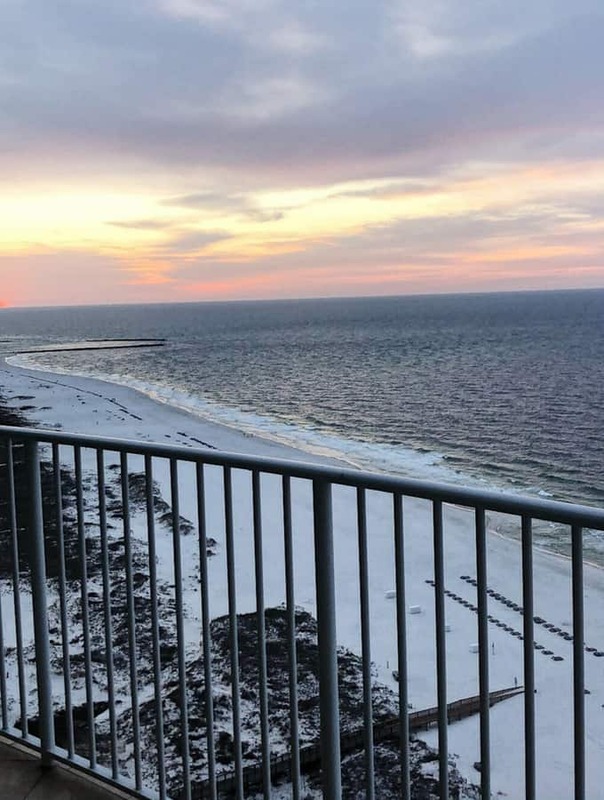 We were lucky enough to be put up on the 20th floor so the views of the beach, the sunrise, and the waves rolling in was absolutely amazing. 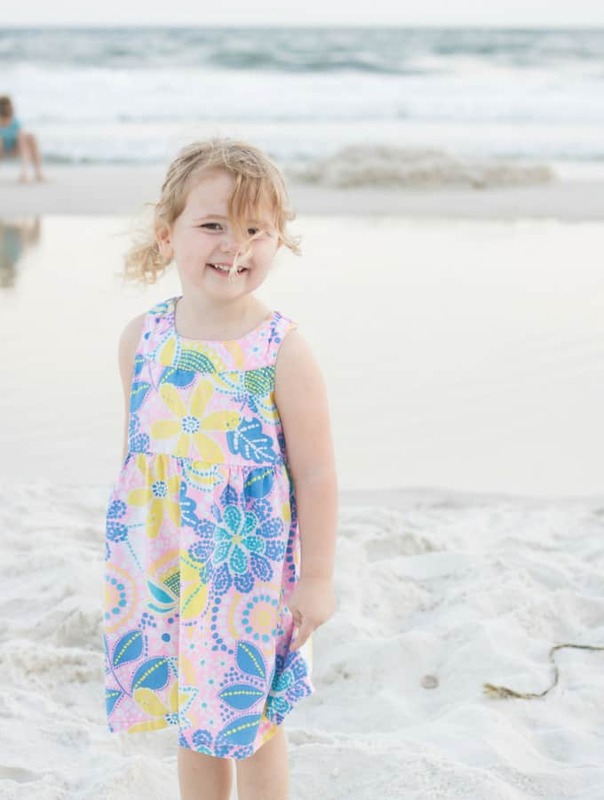 Going to check the beach was the first thing Braylee did every morning we were there. 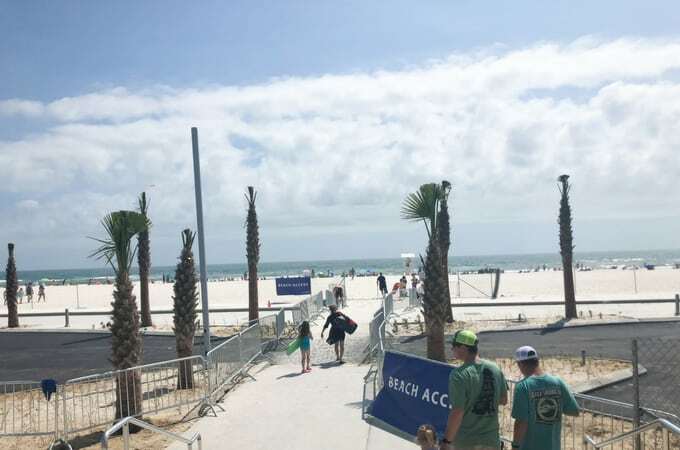 When you check in, each person staying at the condo is given a wristband which works to unlock your condo door and unlocks the gates to get into the condo along with the gates to get to and from the beach. We loved the safety and convenience of these wristbands! 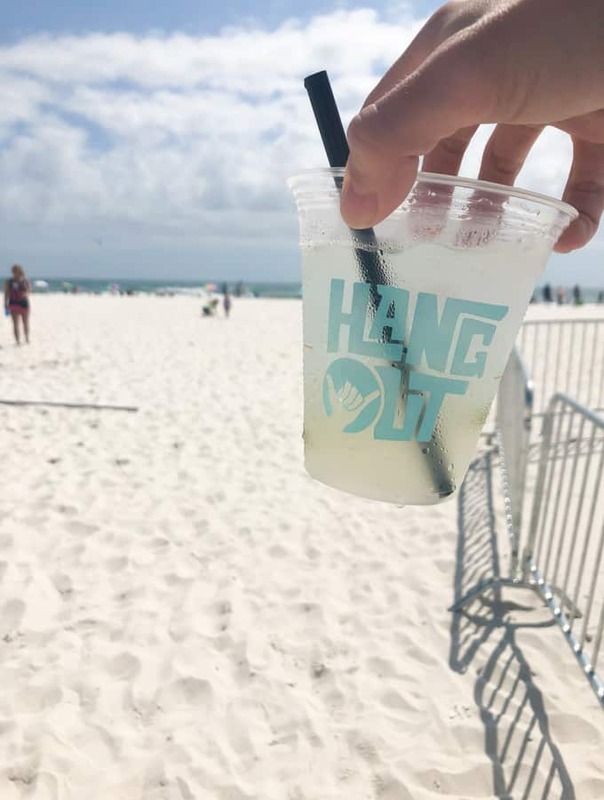 Turquoise Place is located right on the beach so you are literally minutes away from enjoying the beach any time you want. The condo we stayed in was a 3 bedroom 3 bathroom. Each bedroom had its own personal bathroom (the bathrooms were so incredible). 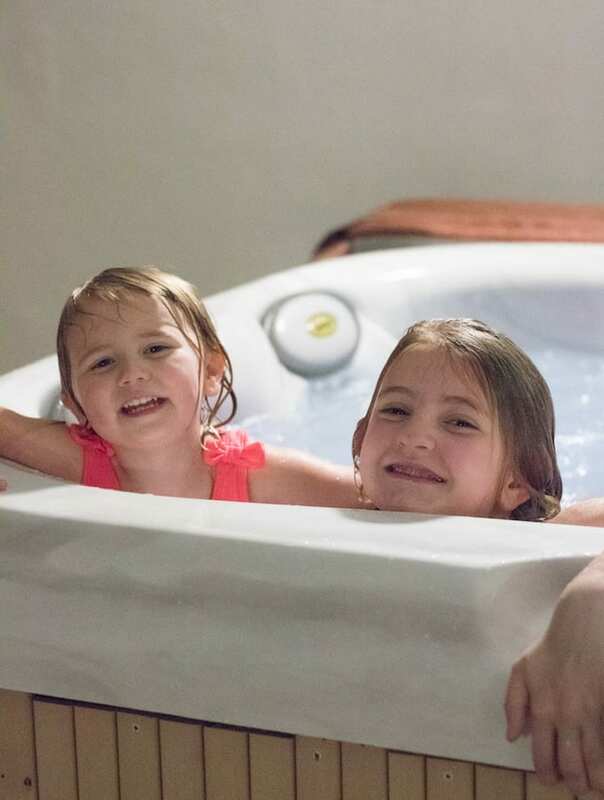 Every condo in Turquoise Place has a personal hot tub on the patio and a grill so that you can enjoy hanging out with your housemates out there. The girls in the patio hot tub. Our condo also had a large 6 person table with chairs on the patio that was nice for having coffee and meals together. You can tell just from that description alone that the patios are HUGE. It fit a grill, table, and hot tub with plenty of room to spare for walking around. The entire condo was so luxurious, but honestly, the patio was my favorite part. It was so beautiful and relaxing out there! 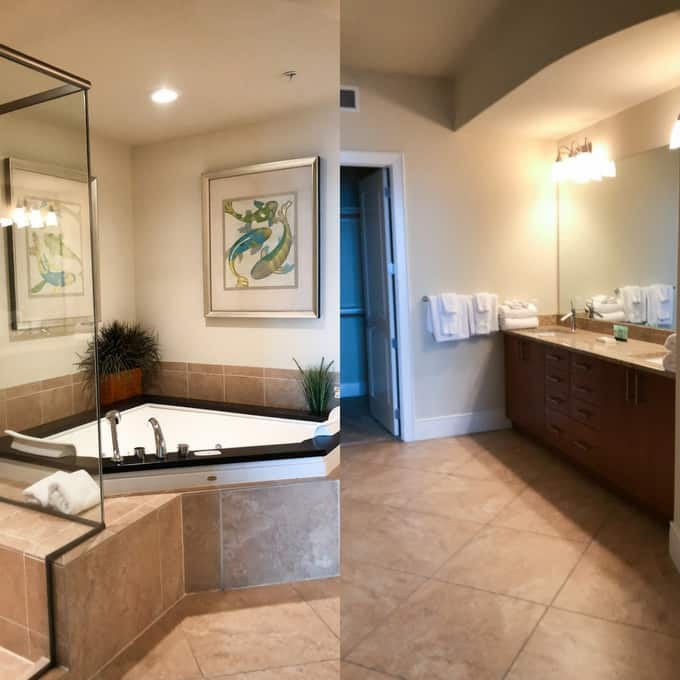 The master bedroom and bathroom were HUGE and housed a king sized bed, a walk-in closet, a large jacuzzi bathtub, and a large walk-in shower. 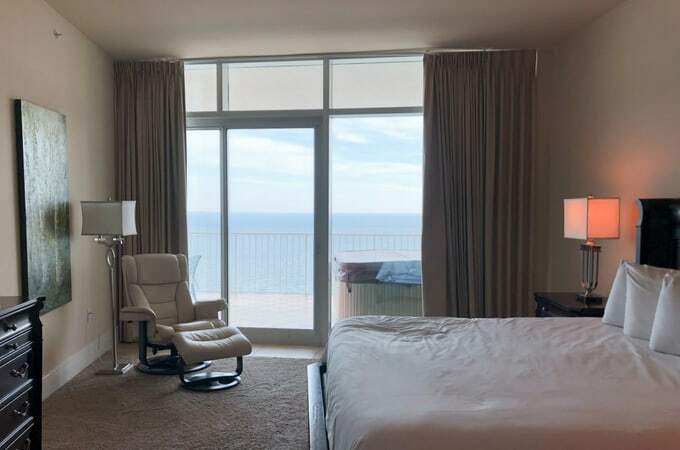 The best part of the master bedroom was that it had floor to ceiling windows and a sliding door that opened up to the patio. The morning view was to die for. The second bedroom was where my father in law stayed and it had a king sized bed with a large bathroom that had a walk in shower. The third bedroom was where my 9-year-old sister in law and my 3-year-old daughter stayed. It had 2 full sized beds in it with a bathroom attached. All of the bedrooms had TVs in them with DVD players which was really nice in the kid’s room because they were able to watch movies to wind down at night. Not that they needed it, they were exhausted from having so much fun! The condo also had a full sized kitchen and dining room. The living room was large and had enough furniture for us all to relax on. There was also a wet bar with a wine fridge and an ice maker. The kitchen was fully stocked with all the plates, pots, and utensils we could need. This is really nice for families that are staying for a full week and don’t want to eat out for every meal. This condo was the most incredible place I have ever stayed. When we go back to Gulf Shores this is the only place we will stay! Here are some of my favorite photos from the beach at our condo. It was so beautiful. One of the best vacations I have ever been on! This was waiting for us when we arrived too. 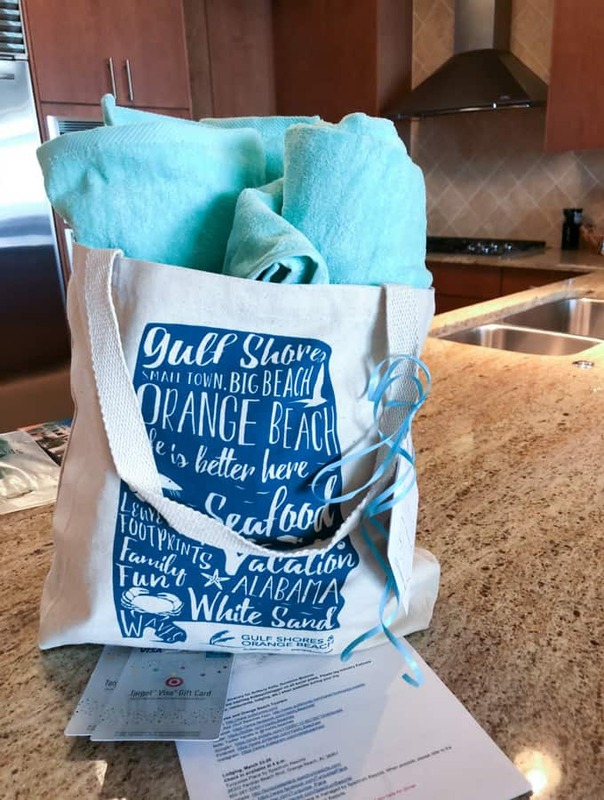 Thank you Spectrum Resorts! The walk to the beach from Turquiose Place. 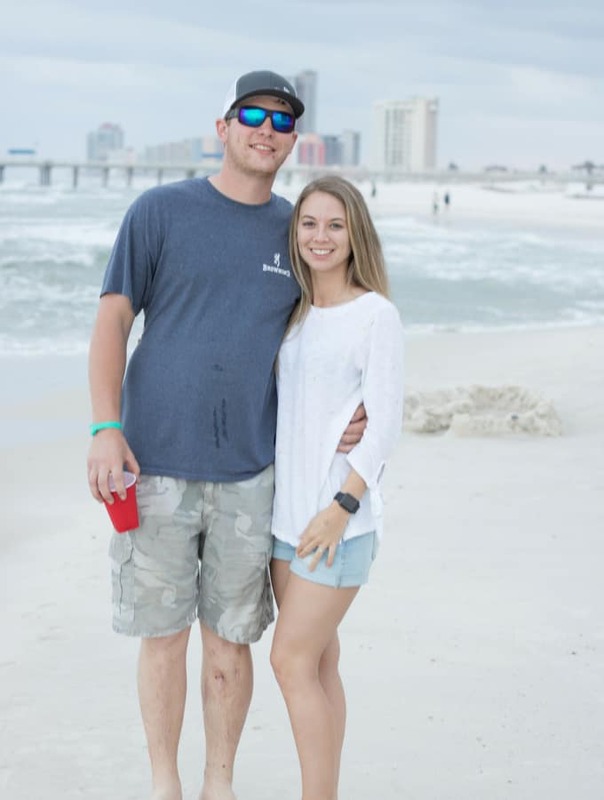 Last month, we took a trip of a lifetime to Gulf Shores, Alabama with my husband, daughter, father in law, and sister in law and it was a blast. 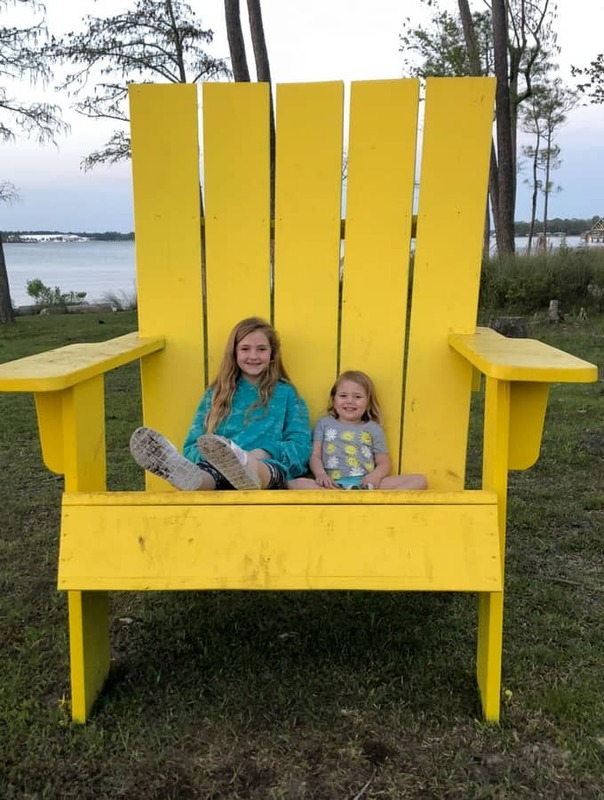 One of the best things about the trip was that there are SO many things to do with kids in Gulf Shores! On our first full day in Gulf Shores, we headed straight to The Track after breakfast. 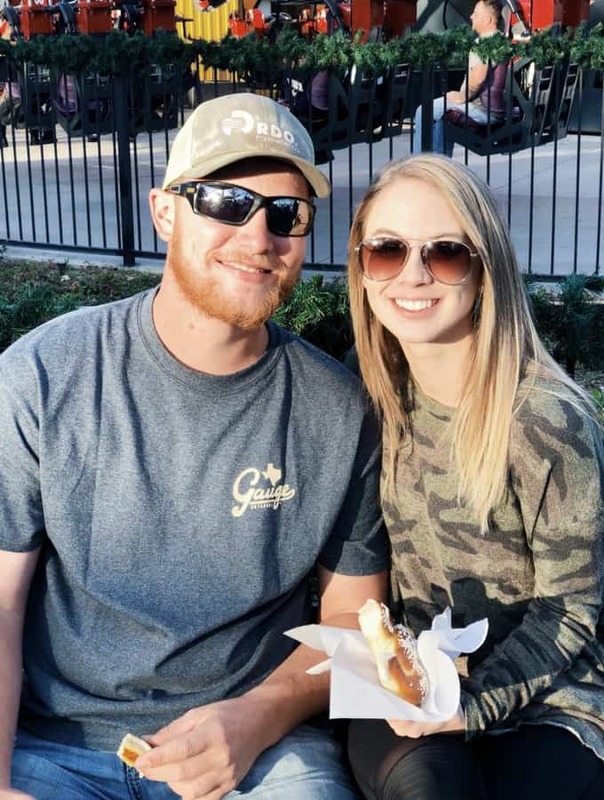 We actually have already been to The Track before when we were in Branson, Missouri so we had an idea of what it would be like and it was extremely similar! 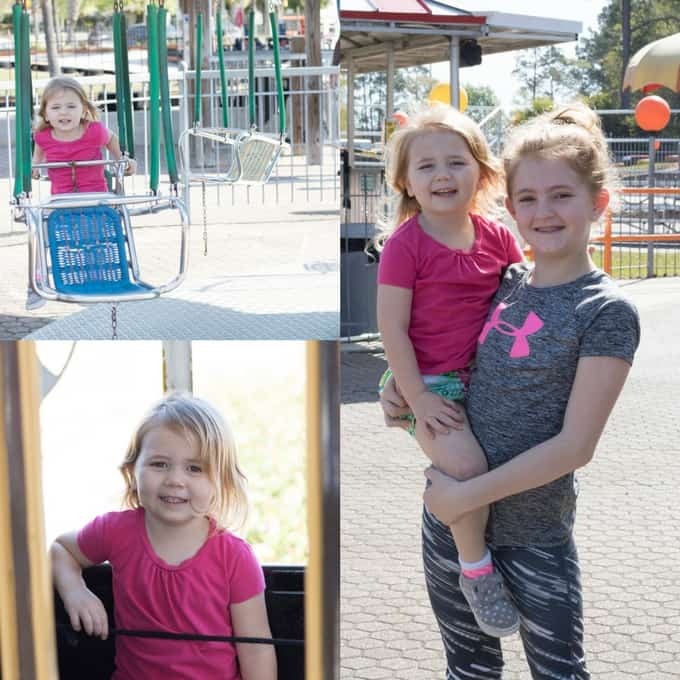 We had two kids with us, one is 10 and the other is 3 so we had quite an age difference, but there were a ton of activities for all age groups there…even adults haha! 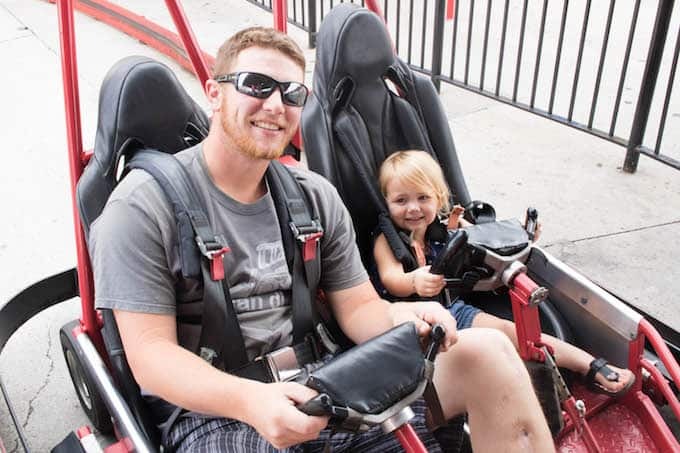 The Track is a Go Kart amusement park that also has bumper boats, an arcade, and mini golf. 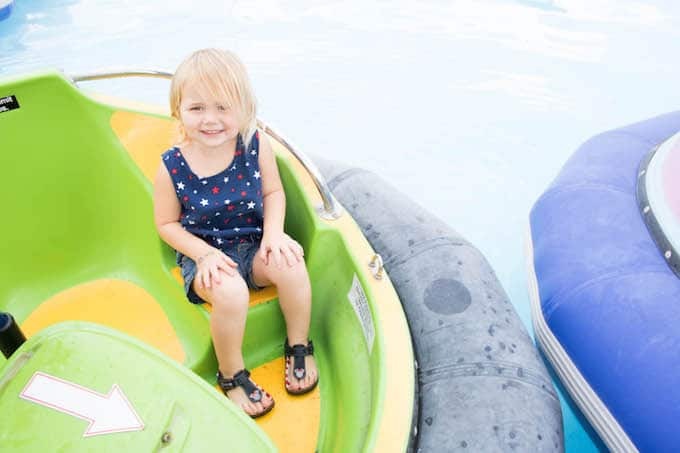 They also have a kid rides section for the little ones like my 3-year-old which had a variety of “roller coasters”, a Ferris wheel, a train they could ride, and the spinning swings. 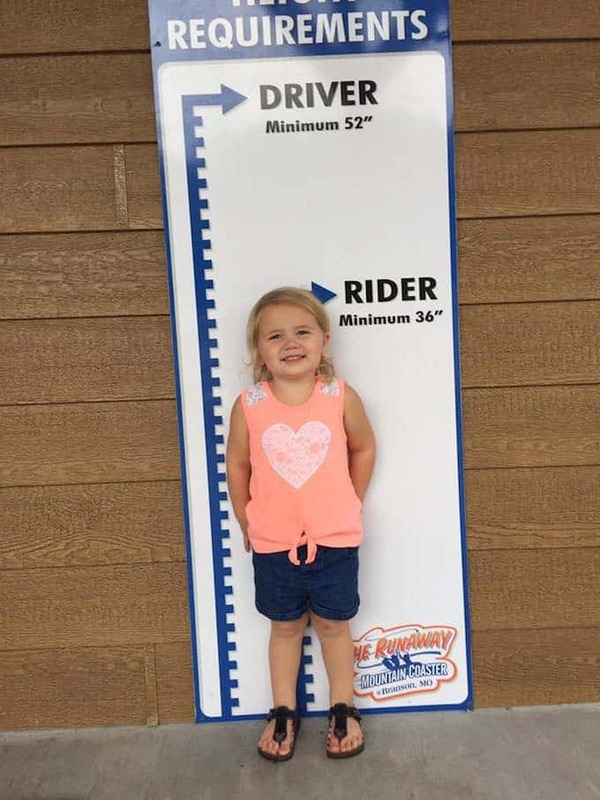 My daughter is super young and wasn’t nervous to ride any of them so they are a great option for your younger children. If you are a major thrill seeker, The Track also has a 110 foot skycoaster! The Go Karts range in age requirements, but my 3 year old was allowed to be a rider with us on most of them! 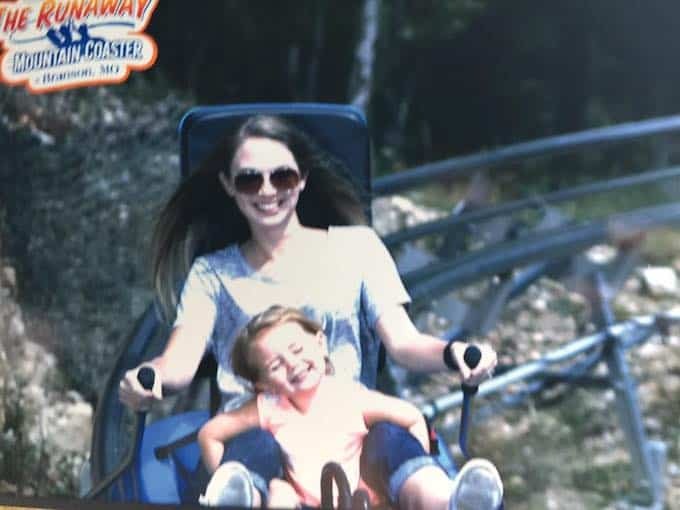 She had a blast riding them too! All in all The Track is somewhere where kids of all ages and adults can have fun so it is a win-win to take the whole family here! 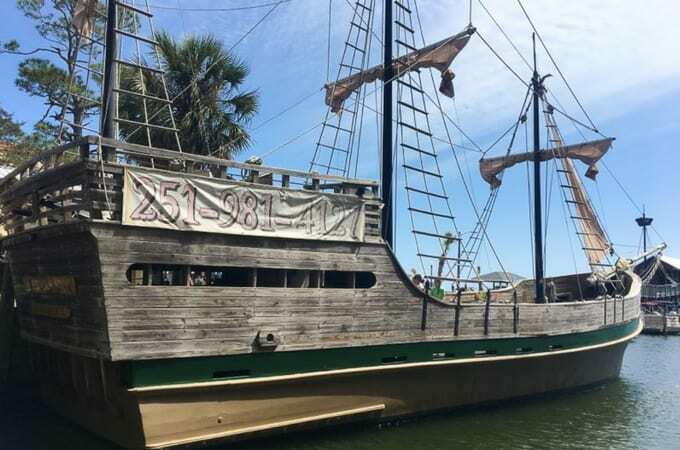 That same afternoon we headed to the Hudson Marina after lunch for the Orange Beach Pirate Cruise. I have to tell you that if there is one thing that you splurge on for the kids this has to be it. We had SO much fun! 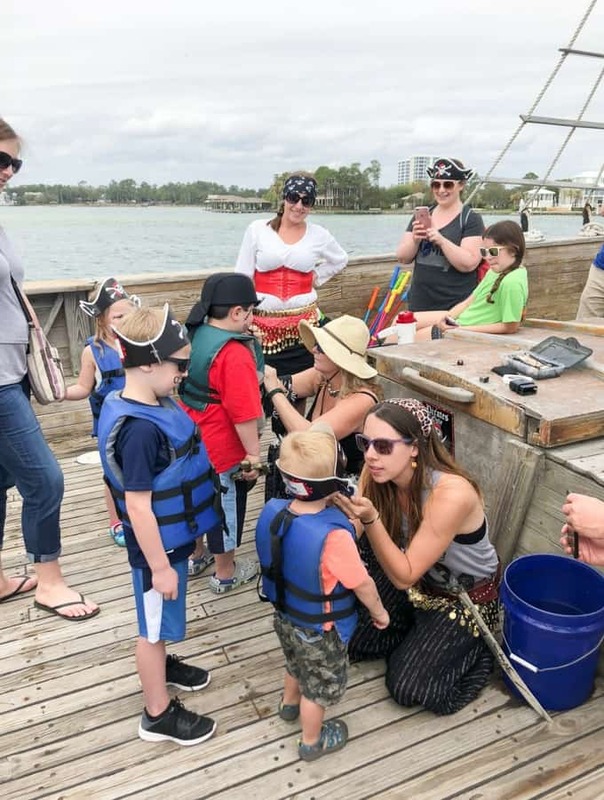 The cruise was about 2 hours long and the entire time the pirate staff entertained the kids with fun activities. I also have to say that the staff completely blew me away. 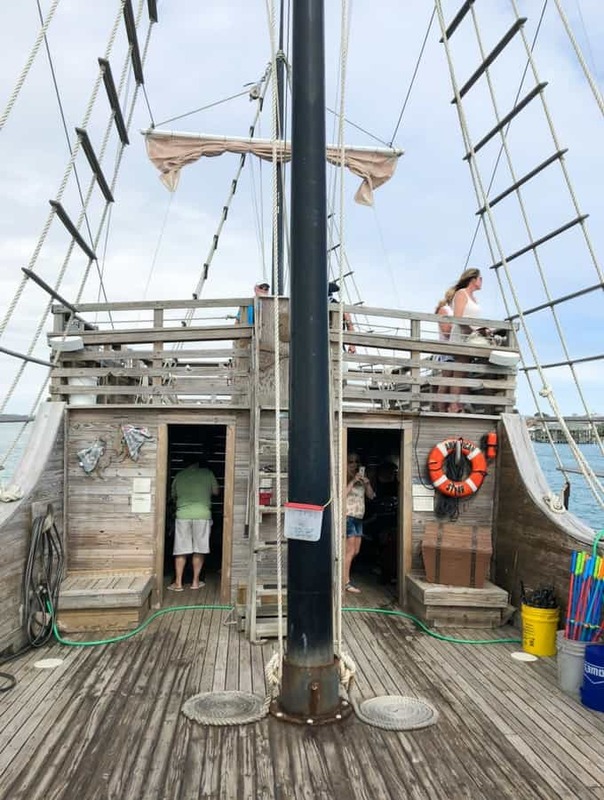 When we got on the boat our daughter wasn’t feeling well and they went out of their way to include her in the activities that she wasn’t feeling up to participating in. They were SO sweet and accommodating, I honestly can’t say enough about how amazing they were to us. They had free snacks and drinks for everyone and the best part is…we got to see dolphins!! As a Texas girl who has never seen a dolphin this was by far the most exciting part! 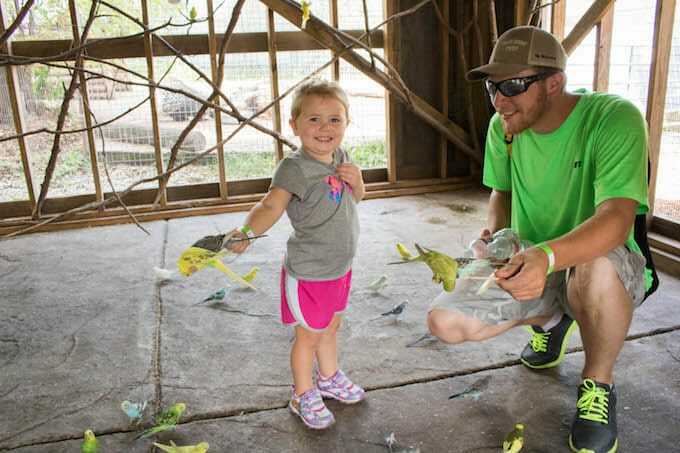 We also visited the Alabama Gulf Coast Zoo one of the mornings we were there and absolutely loved it. 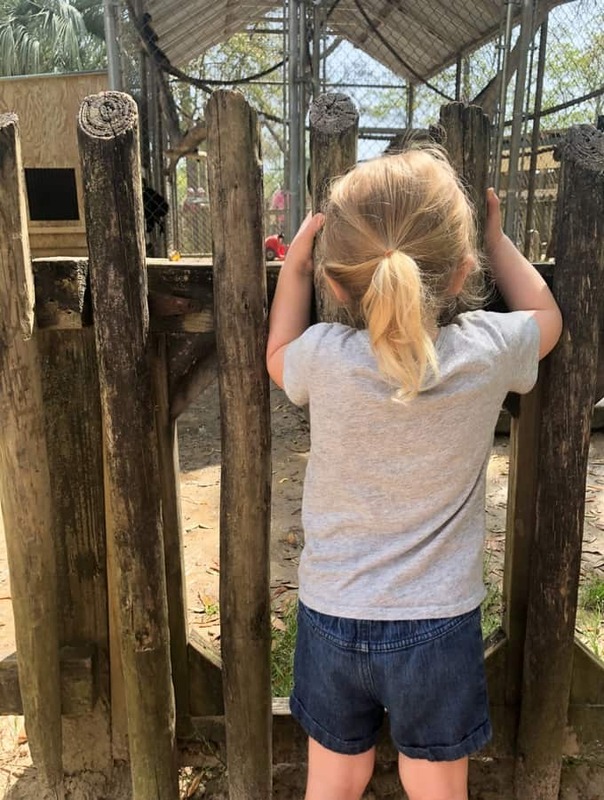 This zoo was named “The Little Zoo That Could” by Animal Planet! It was a smaller zoo, but had a lot to see! I actually prefer the size as opposed to a larger zoo with small children because they get so tired going through anything larger. We made sure to participate in some of the animal encounters too which were super exciting. 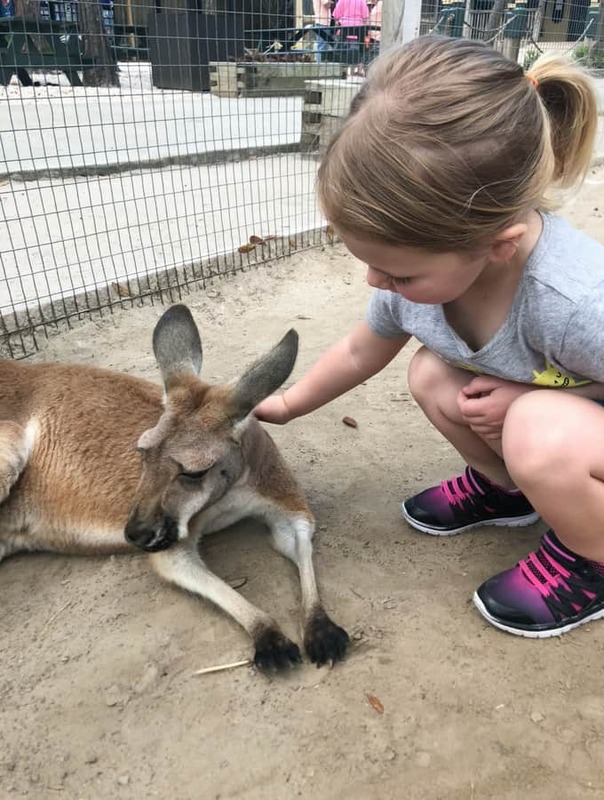 We now can say we have pet a kangaroo! They have animal encounters with kangaroos, lemurs, and reptiles for a small additional fee (I think it was $5 per person). 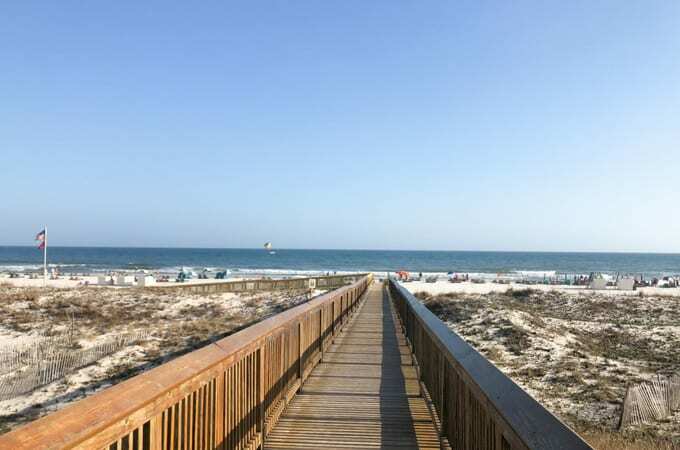 These are just some of the attractions for kids that Gulf Shores, Alabama has to offer. 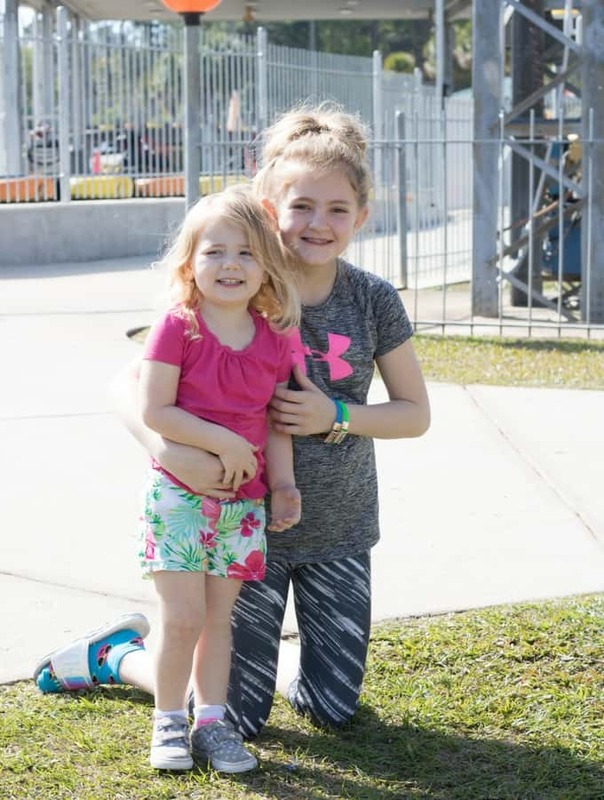 We weren’t there for long enough to try everything, but I am totally confident in saying that your kids will not be bored in Gulf Shores! The final and probably the most important kids attraction is the beach! We had a blast as a family playing on the beach together. 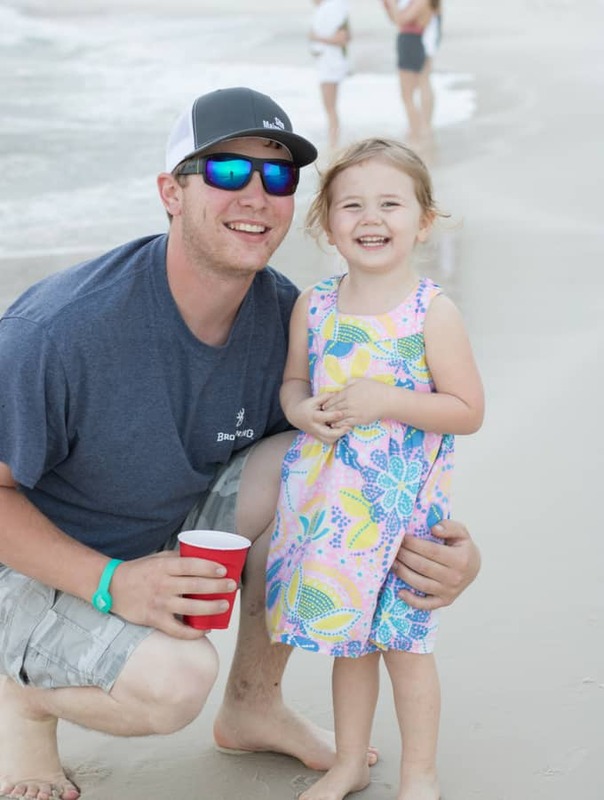 Gulf Shores is one of the best family vacation spots we have been to and we got to experience a lot when we were there so if you have any questions about the destination please reach out to me! Airbnb just released a new feature that is a game changer for your travel plans. You can now book an Airbnb with a 50% deposit, which is a giant shift from the previous requirement of paying in full at the time of booking. Instead of saving up the money for your dream vacation house only to find that it has already been rented for your travel dates, now you can claim that reservation with a 50% deposit. The payments are set up as a 2-time payment plan. One at the time of booking with the second payment being due at a later date (determined by host). 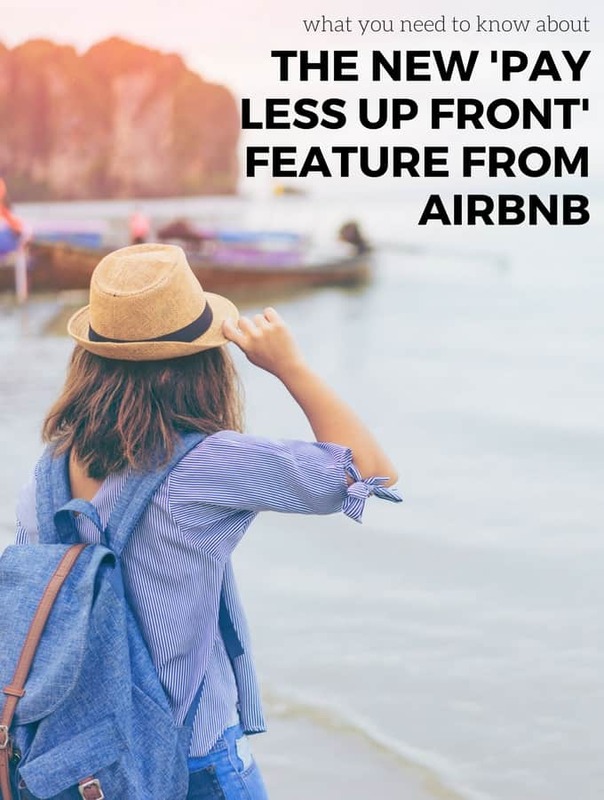 Some important things to remember are that even though you can now reserve the dates, most Airbnb hosts do have a cancellation fee so make sure that you are sure before you book! Airbnb stated that when presented with the opportunity to make a down payment, about 40% of users took that opportunity. The feature is called “pay less up front” and will be presented on the check out screen when reserving your Airbnb. In order to take advantage of the “pay less up front” feature, your stay must be 14 days out and a minimum of $250. This newly added feature is right on the heels of the split payment feature. 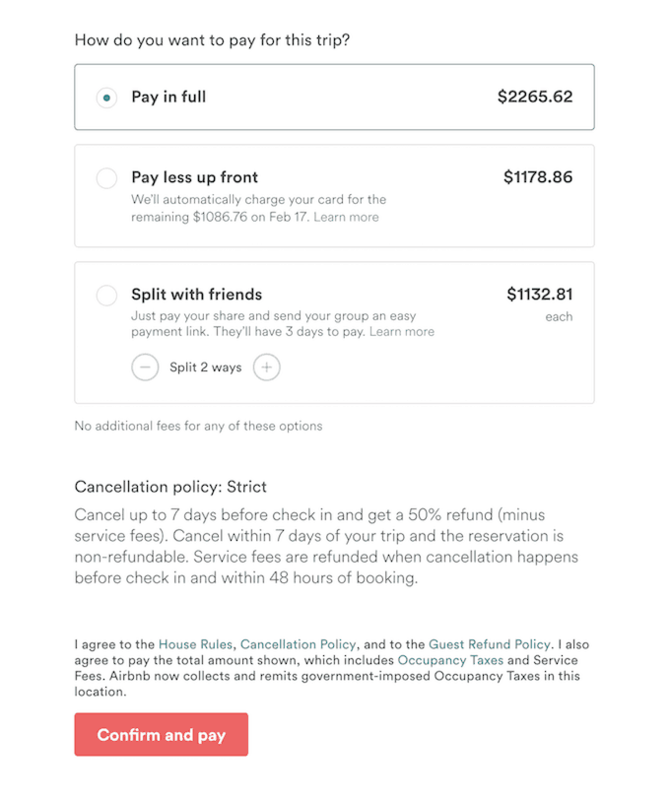 This ever popular feature allows you to only pay your portion of the Airbnb within their website and allows your travel guests to do the same. This makes it much easier to travel in large groups! The news of these two features not only makes it easier for guests, but more profitable for hosts as well. Hosts are now booking more dates in advanced and hosts of larger/more expensive rentals aren’t missing out on renters who prefer to pay the total over time. Want $40 off your first Airbnb rental? Sign up here! 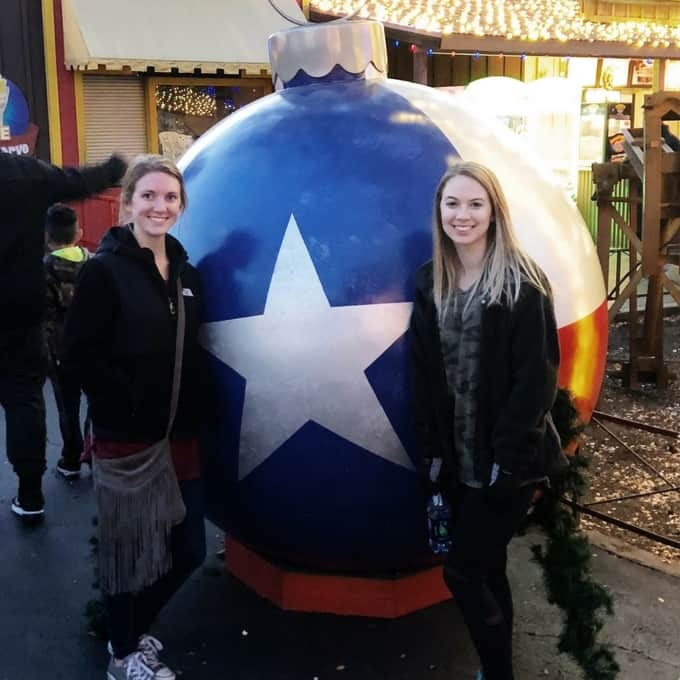 This month, we had the pleasure of being invited out to celebrate Holiday in the Park at Six Flags Over Texas in Arlington! I had been to Six Flags once before, but have never ridden any of the roller coasters and it was my first time to attend Holiday in the Park! The park was absolutely beautiful! It was completely decked out in holiday lights and Christmas cheer! There were even various fire pits throughout the park where you could stop to warm up and make s’mores. The park opened at noon so we arrived then and were able to quickly get through the ticket line. The weather was absolutely perfect. If you live in Texas then you know that we have had an abnormally warm November. 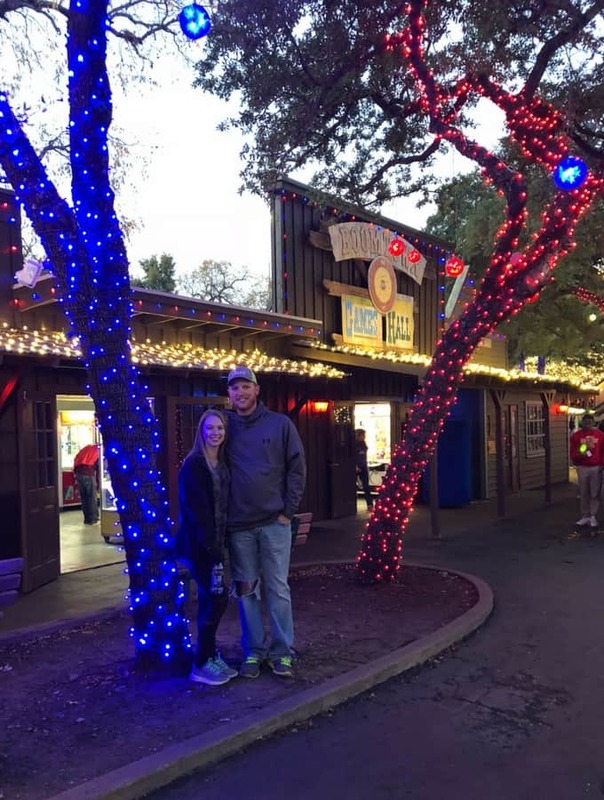 The warmth was perfect for our day outside at Six Flags, but as soon as the sun went down it was really chilly so I recommend taking a jacket, gloves, and a beanie if you are headed to Holiday in the Park. We went into the day expecting to want to buy a Flash Pass like we did at Hurricane Harbor (the lines were HOURS long), but the lines at Six Flags were a lot quicker so we didn’t end up buying one. I do have to say though if you go on a day that is super busy, like we did at Hurricane Harbor, the Flash Passes are amazing. We ate lunch before we got to the park but had snacks, hot chocolate, and dinner while we were there. You can expect typical prices for theme park food here so make sure to bring extra money. There are a ton of cute photo opportunities and lots of stuff for kids at Holiday in the Park too! You can read more about it here. Since the friends I brought with me to Six Flags were seasoned roller coaster riders, they wanted to take me on the Titan first. Which is the most thrilling ride at the theme park! It gets up to speeds of 84 mph and has a 250-foot drop! After getting the first and scariest ride over with we rode almost every ride on the theme park’s “thrill rides list“. It was a ton of fun and even though I was scared on every ride I also had a blast on them all! Pandemonium – love this one because all four of us got to ride together! There is a place to put your things near each ride so that you don’t have to hold it, but I would still advise not to bring any expensive cameras or tons of cash or anything just in case. A lot of the rides have zipper pockets in the cars now so that you can store your phone/wallet/sunglasses in there while you are riding. Overall, we had a TON of fun even with me being terrified of every ride. We will be back again! This giveaway is sponsored by Enchant Christmas! Today is a day that I have been looking forward to for weeks! I am giving away a family four pack of tickets to the Enchant Christmas VIP Premiere Party in Arlington! This premiere party is happening several days before Enchant actually opens, so you will get to experience it before anyone else! Enchant Christmas is a light maze made of millions of dazzling Christmas lights. 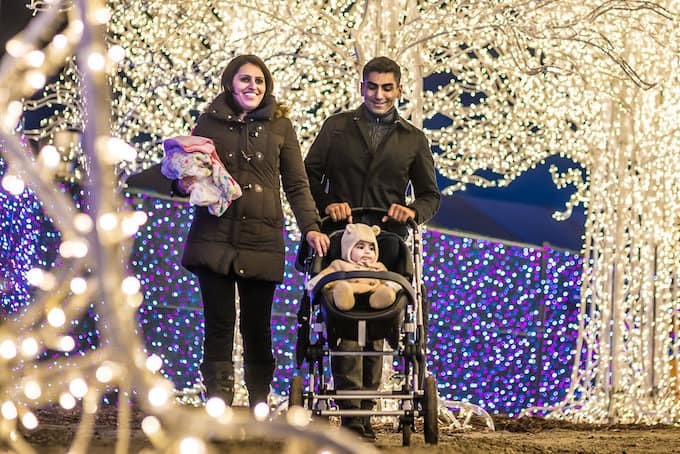 In addition to navigating your way through the light maze you will be able to stop at attractions like visiting Santa, gliding across an ice skating pond, sharing good food and hot cocoa with loved ones, and even shopping in their Christmas market for gifts! 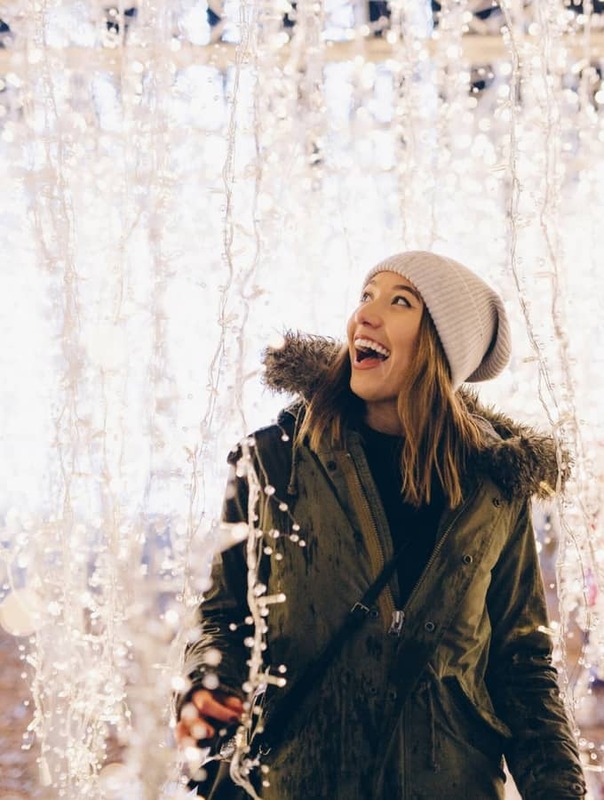 The light maze is 3 acres FULL of Christmas lights which makes it the largest light maze in the world. This event that we are giving away tickets to is exclusive! You couldn’t even buy these tickets if you wanted to so be sure to scroll to the bottom of this post and enter! Outdoor event – rain or shine, the event will still happen! If you can’t attend the premiere party you can still buy tickets to the opening after November 24th here. Be quick though, there are a limited amount of tickets for the attraction each night! To win, all you have to do is enter below! 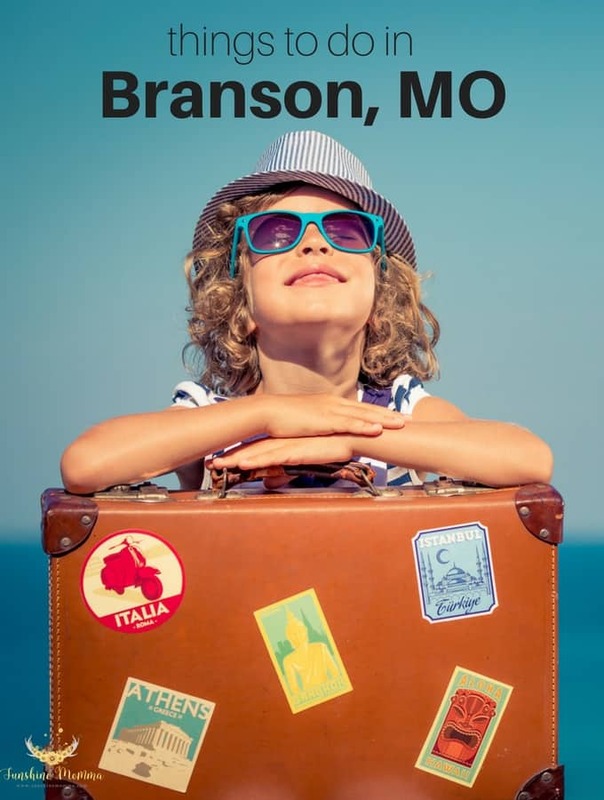 This year for our family vacation we decided to head to Branson, MO with Brandon’s sister and grandparents. I have always heard that Branson was a great family vacation destination, but this was our first time to visit! I first want to say that the people in Branson are so incredibly nice. Everyone we came in contact with struck up a conversation with us and wanted to know where we were from. It was great to feel so welcomed! 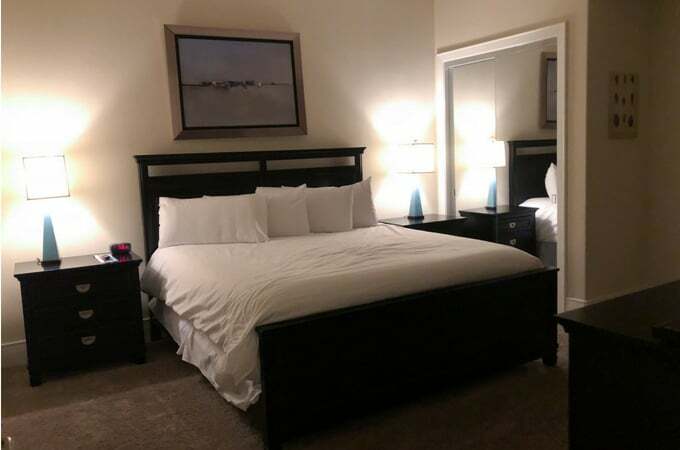 There were a ton of hotel and resort choices in the area, but since we were going with such a large group and wanted to be able to cook meals instead of eating out every meal we chose to book an Airbnb. Our Airbnb was perfect for us! This was my first time staying in an Airbnb and the experience was amazing. I honestly don’t see myself traveling any other way! The house we stayed in was inexpensive, slept all 6 of us comfortably, and even had a screened in porch which I fell in love with. To save on expenses we cooked breakfast at the Airbnb each morning and only ate out for certain meals. 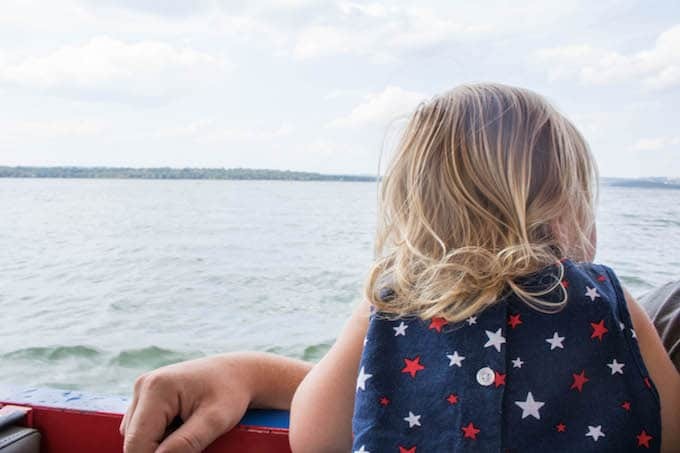 I definitely suggest checking out Groupon for things to do in Branson before you head out because there are a ton of good deals over there! We also got a really good deal on the escape room at Branson Fun Zone through Groupon. If you’ve never done an escape room you have to try it. 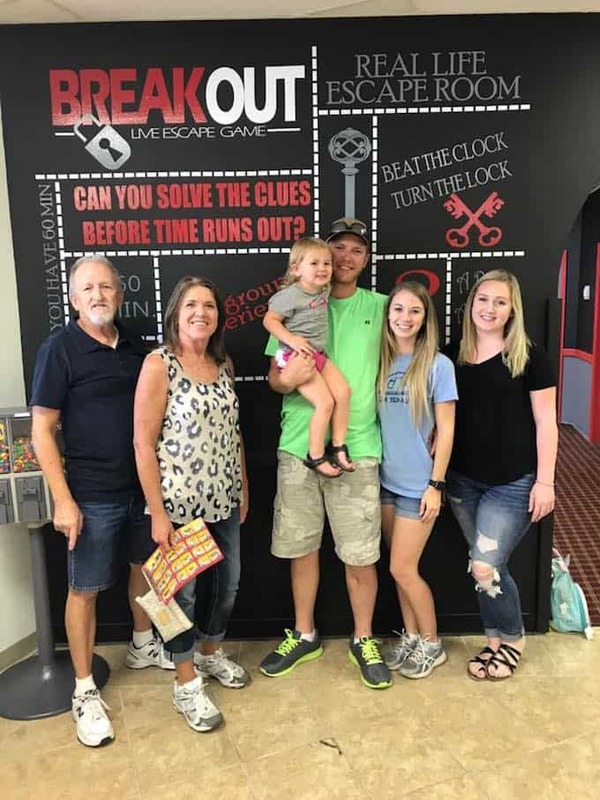 We had a blast and DID escape with 20 minutes to spare. Woohoo! One of the best experiences of the trip was B getting to ride her first roller coaster. We rode 2 different mountain coasters while we were in Branson and B was tall enough to ride with me on the first one. 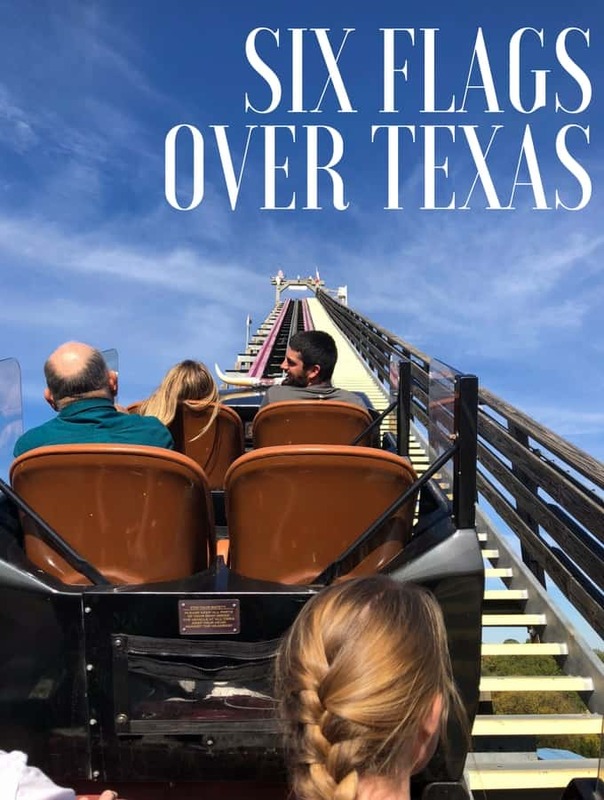 I thought she would be terrified because I am not a huge fan of roller coasters… I was SO wrong. 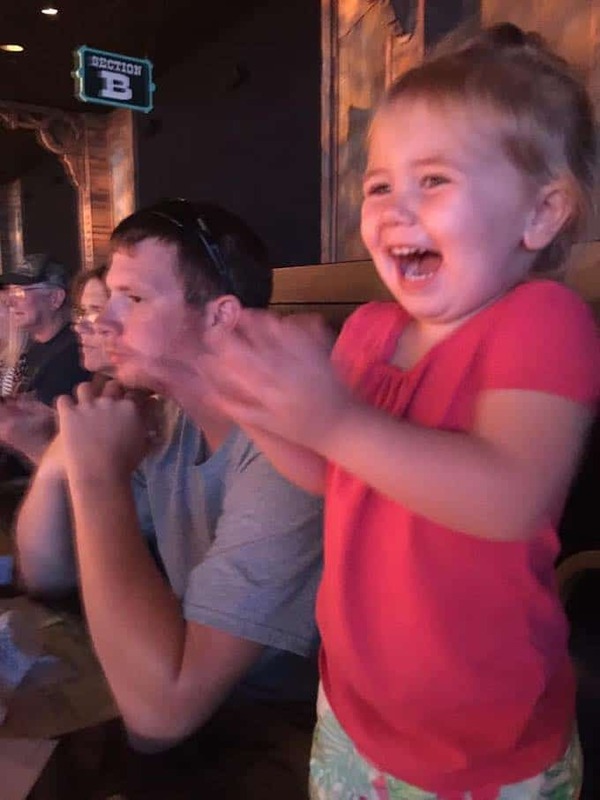 The entire time she was screaming “Wooohooo! Faster, faster!”. 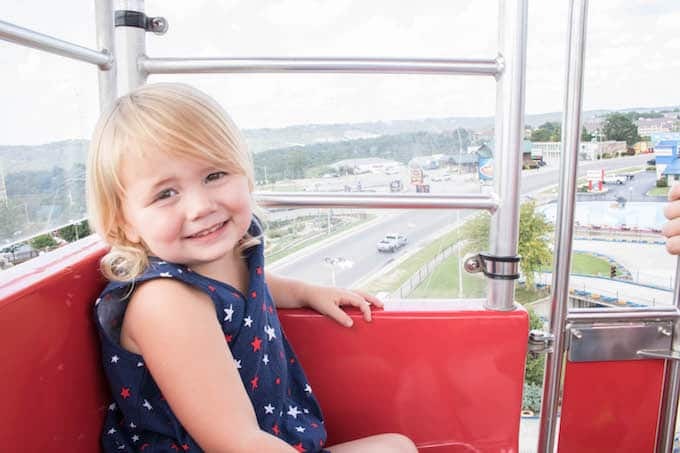 The entire time we were in Branson, Braylee was begging to go on the ferris wheel and all Brandon wanted to do was ride the go-karts so we visited The Track in Branson which had both! We bought tickets and rode the ferris wheel, go-carts, played arcade games, and drove the bumper boats. B had a blast since it was her first time to do any of this! Two of the attractions that we were looking forward to the most was Ride the Ducks and The Dixie Stampede. 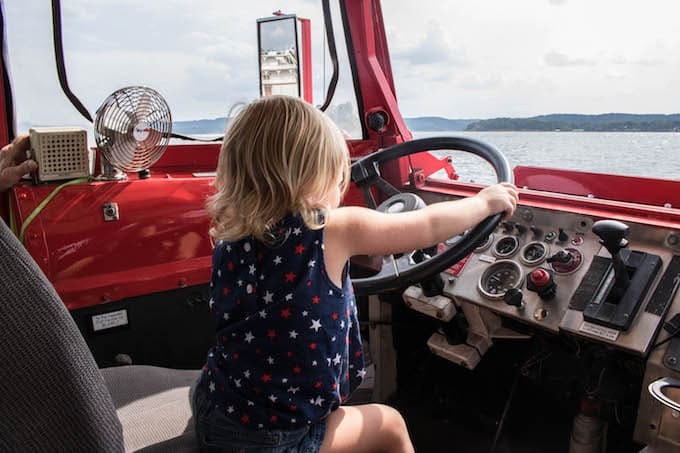 Ride the Ducks is a land and water tour where you “ride the duck” through the Ozark mountains and then back down into Table Rock Lake. It was SO FUN and the views were gorgeous! B even got to drive the duck! The Dixie Stampede is a dinner attraction in Branson that serves delicious food. There was so much food I couldn’t have even dreamed of eating it all! While you are eating you get to watch a western show featuring 32 beautiful horses. If you get to the show early you can walk around and see the horses in their stables! I wanted to note on here how amazing the staff was at this show. We didn’t purchase a ticket for B because I knew I would have plenty of food to share with her. When we arrived there were many empty seats next to us so I let her sit next to me even though she was supposed to sit in my lap. The waiter not only let B have her own seat for the show, but he even served her a meal of her own! So sweet! A few other places that we visited were the St. James Winery and Andy’s Frozen Custard. Both were amazing! I highly recommend the Pink Catawba and eating at their restaurant if you decide to visit St. James Winery. Their food was delicious! We stayed in Branson for 5 busy days and didn’t even make a dent in all of the fun things that there is to do there! We will definitely visit again one day!